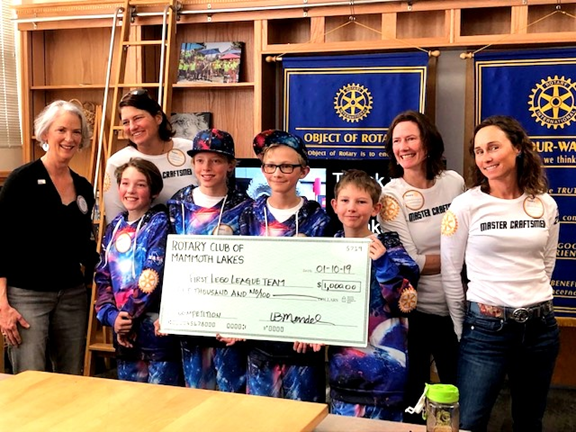 The Rotary Club of Mammoth Lakes is hosting its 10th Annual No Limit Hold'em Poker Tournament on April 4th, 2019 at 6 p.m at LAKANUKI, in the Village. This charity event is for a worthwhile cause. Most of the proceeds raised is for our Mammoth High School Senior Scholarship Program, which provides FREE TUITION for the selected student who attends Cerro Coso College and attains an AA Degree and FREE TUITION for his/her Junior and Senior years at any University of California or any California State University or University of Nevada, Reno school. or at the link in UpComing Events at top of the right hand column of this page. 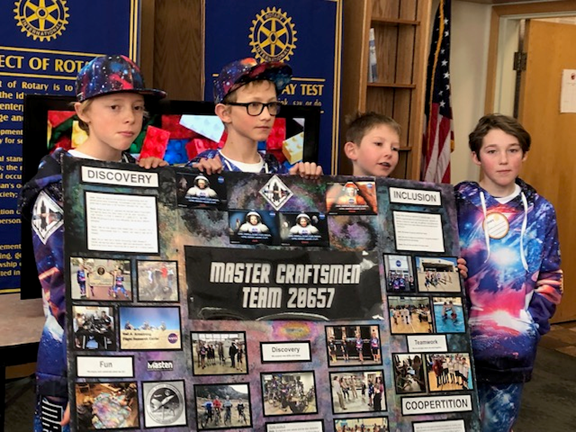 Our Rotary Club presented to the Master Craftsmen – First Lego League team a check for $1,000 to help them continue with their development programs and future field trips and competitions. Presenting the check is President Luan Mendel together with coaches and mothers Drea Perry, Cara Leonard, and Elise Howell. Luan Mendel presents Rich Boccia with his first Paul Harris Award. President Luan Mendel recently noted: "I believe I speak for all involved in saying the Diamond Masquerade Ball was a rousing success. The food and music were terrific, our celebration of Jack Copeland was a lovely moment for everyone present, and attendees successfully bid on an amazing assortment of silent and live auction items. Watching Chief Al Davis bump and grind as part of his sales pitch for "A Day at the Range with the Chief" was worth the price of a ticket all by itself. The event was also, of course, a fundraiser, and it appears from an early tally of income and expenses that we made in the neighborhood of $6,000. Many thanks to Rich Boccia and his committee that planned event, to those who helped with set up and clean up and the event itself, and to all who attended. 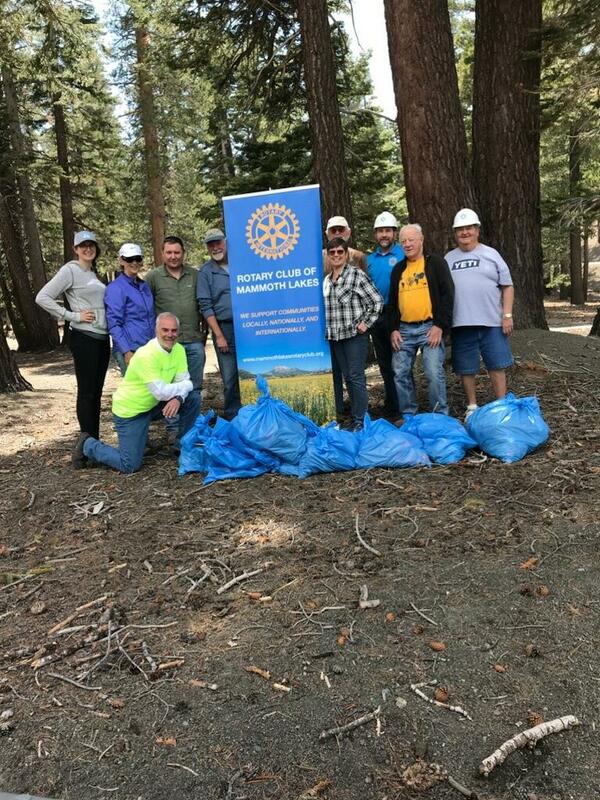 Well done, Mammoth Lakes Rotarians!" Below of the left is Robert Sharp, Vice President of Eastern Sierra Community Bank, presenting a donation check of $2,500 to the event and on the right is Jack Copeland receiving this year's Service Above Self Award from the Rotary Club of Mammoth Lakes. Sheryl Saari presents a permanent badge to our newest member, Talene Shabanian, who is responsible for fundraising at Mammoth Hospital. 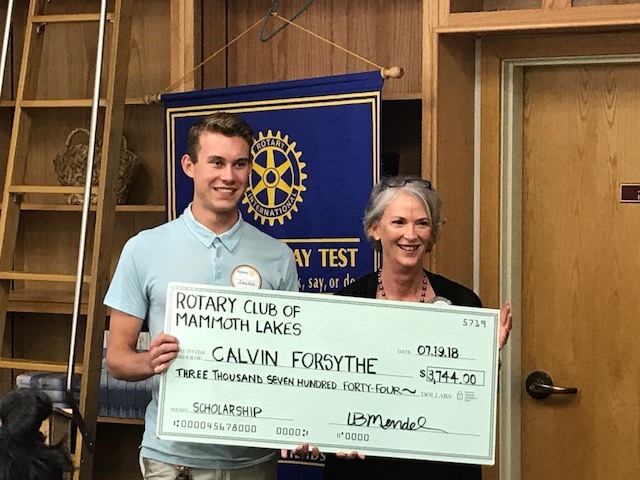 Calvin Forsythe, 2016 recipient of our college completion scholarship, received his first check from club president Luan Mendel on July 19th. As required by the terms of the scholarship, Calvin successfully completed two years (and two A.A. degrees) at Cerro Coso Community College and was accepted as a transfer student at San Diego State University. The club will provide financial support for Calvin's junior and senior years, and we look forward to following his progress toward a four-year degree. 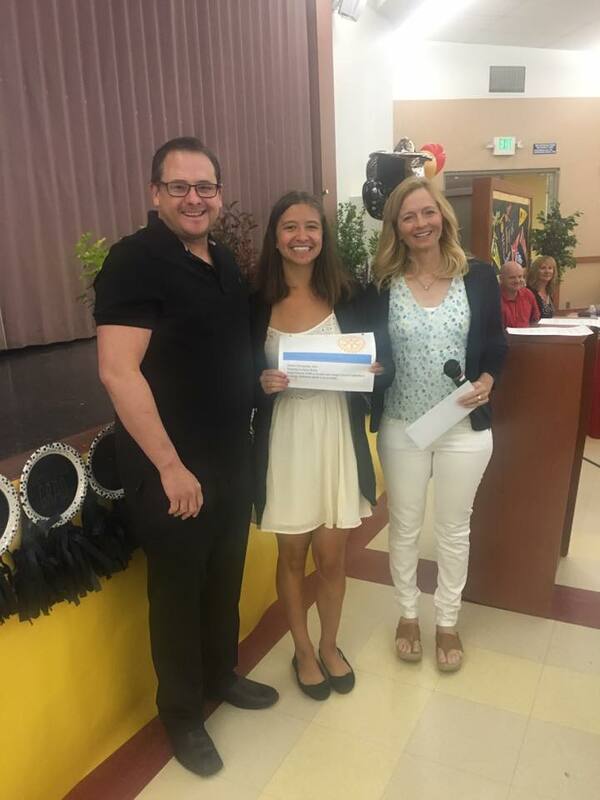 At the Mammoth High School awards breakfast on June 8, Rotary awarded its 2018 scholarship to Priscila Yanez, and our 2017 award recipient, Gloria Solorio, and President Rich Boccia are in the photo with her. Rotary also presented two recipients of the 2018 Bea Tomko Memorial Scholarship, which is awarded to graduating Interact members. The recipients are Meaghan Thompson and Hope Reeves; Tanner Bissonette, also graduating, was Interact President for 2017-18, and Joanne Hunt and Robert Sharp, Interact coordinators are also in the photo. On Saturday, we grilled hot dogs for the people at the Community Health and Safety Fair that was at Shady Rest Park. 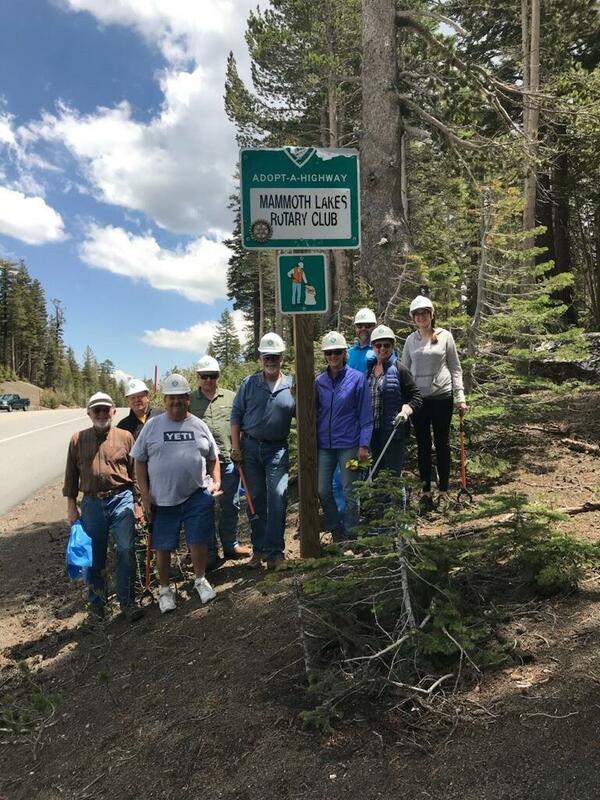 On May 24, 2018, our club cleaned a 2 mile stretch of Highway 203 from just before the Chair 10 parking lot to the Mammoth Scenic Loop Turnoff as part of the Caltrans Adopt-A-Highway Program. 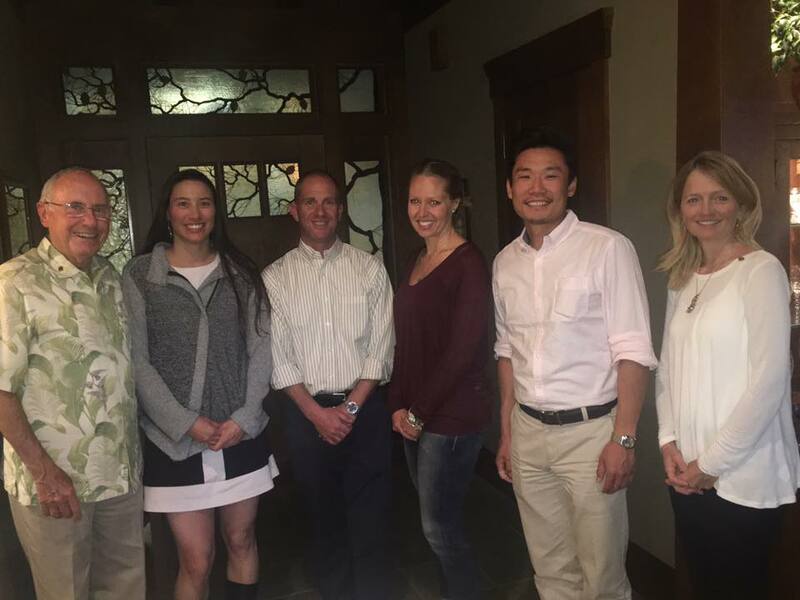 On April 30, 2018, our club sponsored a Candidate Forum for all people who are running for election for offices of Mono County Superintendent of Schools, Town of Mammoth Lakes Council Member and Mono County Supervisor - 1st & 5th Districts. The event was very well attended and was hosted by Rich Boccia, our President, who acted as moderator. 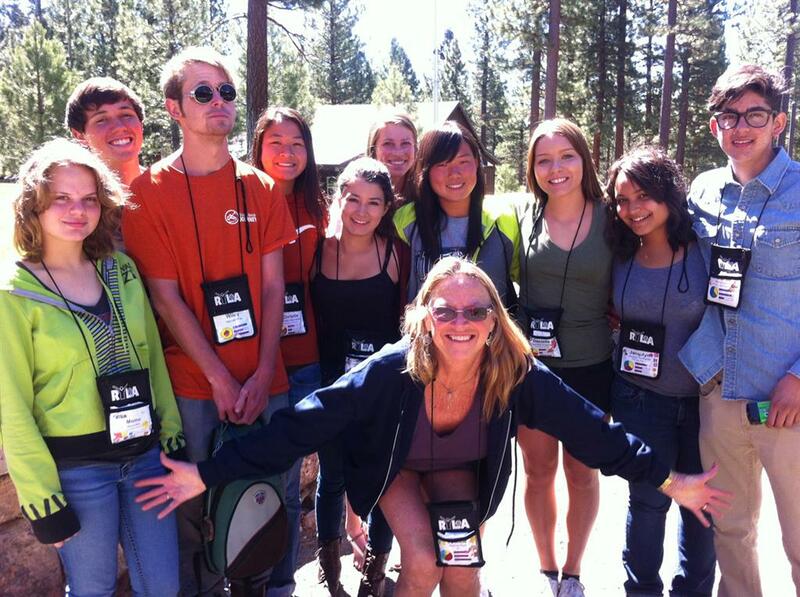 Each spring the Rotary Youth Instrumental Music Contest takes place around the world and right here in Mammoth Lakes. Our local contest was held on Thursday, March 8, and club members were treated to performances by four young musicians from Mammoth High School. Junior Guy La Borde placed first in the competition with an original composition on the guitar. Tyler Goodwin, also a junior, played the tenor sax and took second. Sophomore Barrett Mannetter claimed third place with his performance on the alto sax, and another sophomore Cardiff Smith, a trumpet player, took fourth place. The young men were fortunate to have three local professional musicians judging their performances. We are grateful to Mike Dostrow, Joe Gray, and Chuck Scatolini for generously giving of their time and expertise to encourage and support budding musical talents here in our community. We are also indebted to MHS music teacher Michael Hammers (not pictured), who encourages jazz band members to enter the competition and allows us to use his music classroom for the event. Also in attendance were Rotarians Sarah Carmichael, Dennis Brown, Luan Mendel (organizer of the event), and Jim & Shannon Clark. 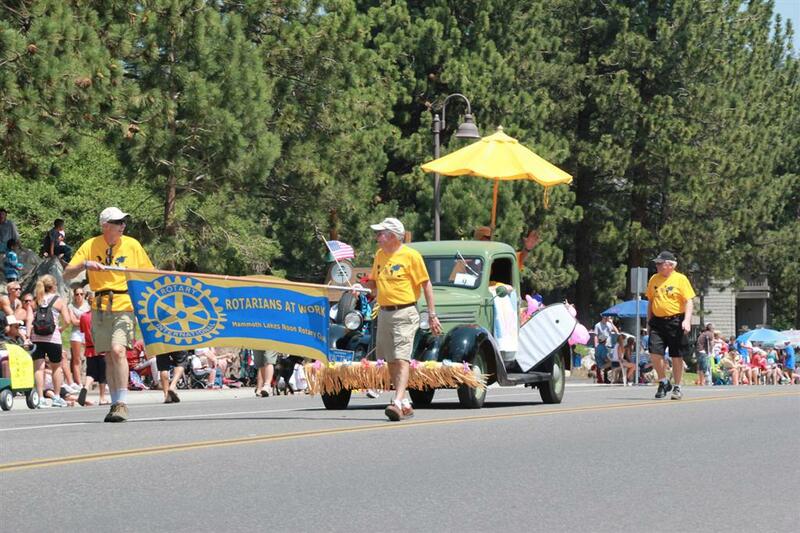 The Rotary Club of Mammoth Lakes is now accepting applications for the 2018 Youth Instrumental Music Contest. The local contest is open to high school students (grades 9-12) or home-schooled students ages 14-18. Students may choose any musical selection and play it on the instrument of his or her choice. Our local contest will be held on Thursday, March 8, at 6:30 p.m. in the music room at Mammoth High School. Cash prizes are award for first, second, and third places, and the winner advances to the area and district level competitions. Contact Luan Mendel at lmendel@gmail.com for more information and entry forms. 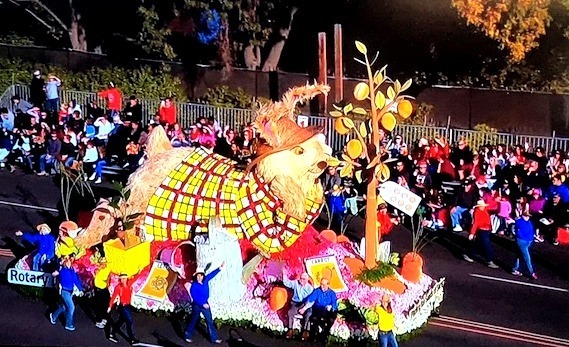 At the 129th Annual Rose Parade, the Rotary float was awarded the Princess Award for the most outstanding floral presentation among entries 35 feet and under in length. 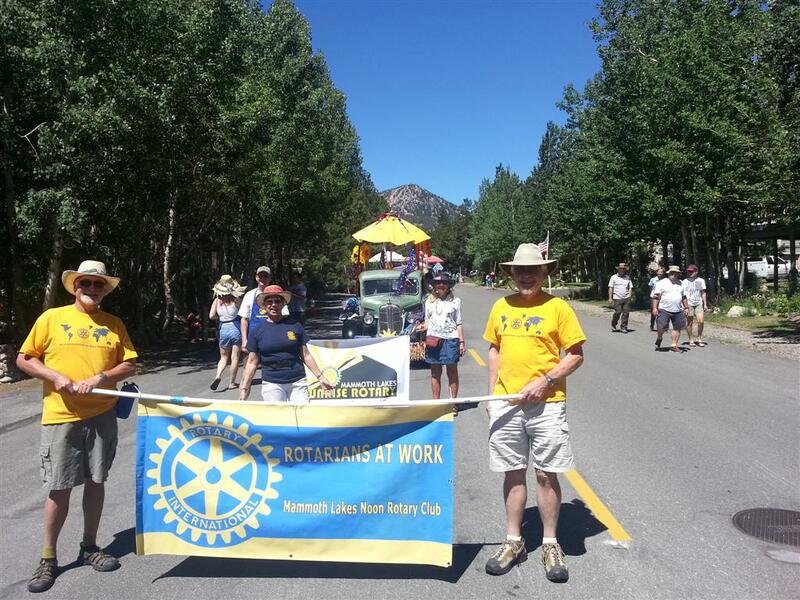 Rotarians from District 5190, including Mammoth Lakes, participated in making the float and walking in the parade. 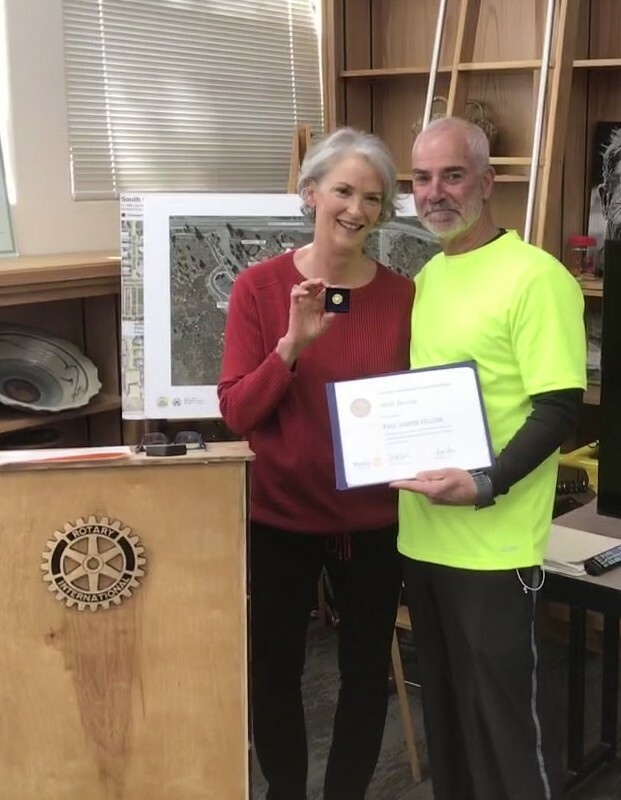 Judy Bornfeld, President of the Mammoth Hospital Auxiliary, presents a 2nd check to Rich Boccia for $8,000 to be distributed to other local Rotary clubs to give to victums of the various California wild fires. This money came from the 1 day sales of the Castoff thrift store and was more than matched by the Auxiliary. With Rich and Judy is Rich's wife, Diane. 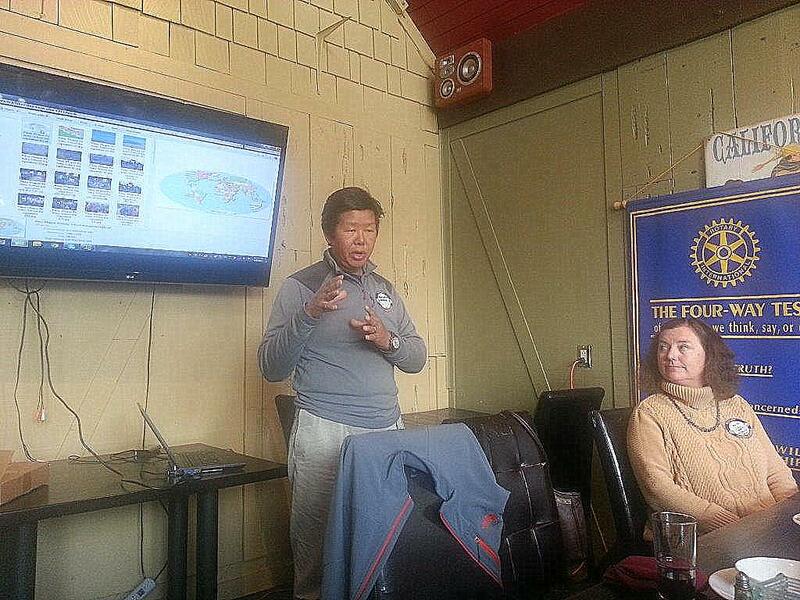 The presentation was made at the club's annual Christmas Party at Nevados Restaurant in Mammoth Lakes. 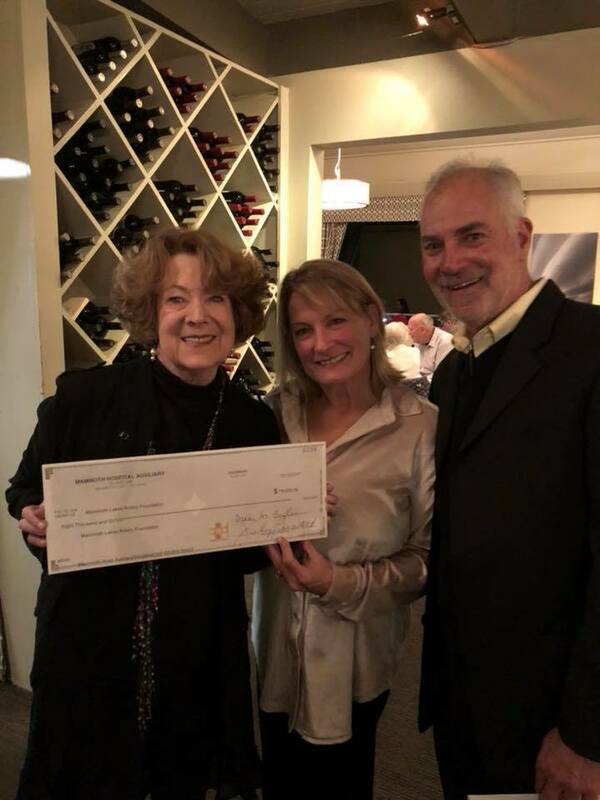 Rich Boccia accepts a check for $10,000 from Judy Bornfeld and Karen Curry of the Mammoth Hospital Auxiliary who donated the proceeds from their Hurricane Relief Fundraiser. This fundraiser was comprised of 2 days sales at the Castoff thrift store and the Auxiliary then matched those monies. 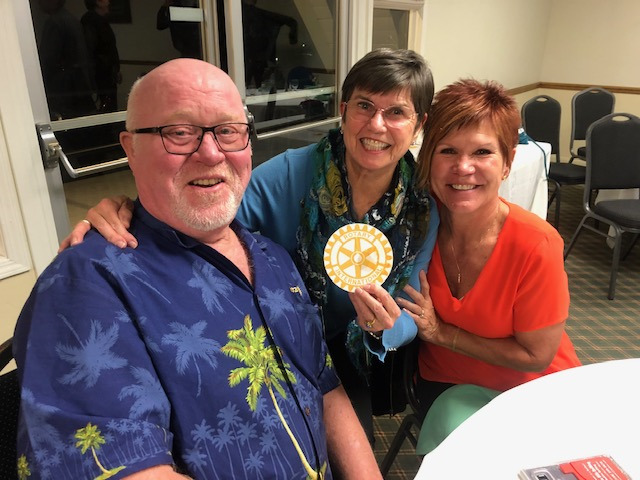 The Auxiliary chose our Rotary club to forward these funds to the local Rotary clubs in Texas, Florida and Puerto Rico to distribute them to those people most in need who were devastated by the hurricanes. Luan, Lois, Dennis, Gary & Sarah get ready to serve up the goodies at the Gran Fondo cycle event. Our illustrious leader, Rich, is behind the camera. 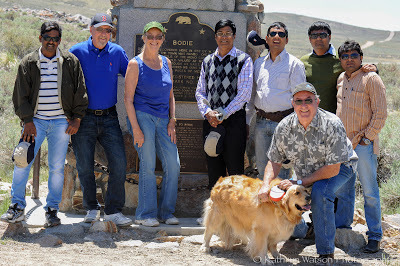 District Governor Doug McDonald and his wife Karen on a hike with Byng & Joanne Hunt at Convict Lake. Replies from Doug and Karen after the trip: Doug said "So enjoyed our time with you and the Club! Rotary with Altitude on the Edge of Greatness!" 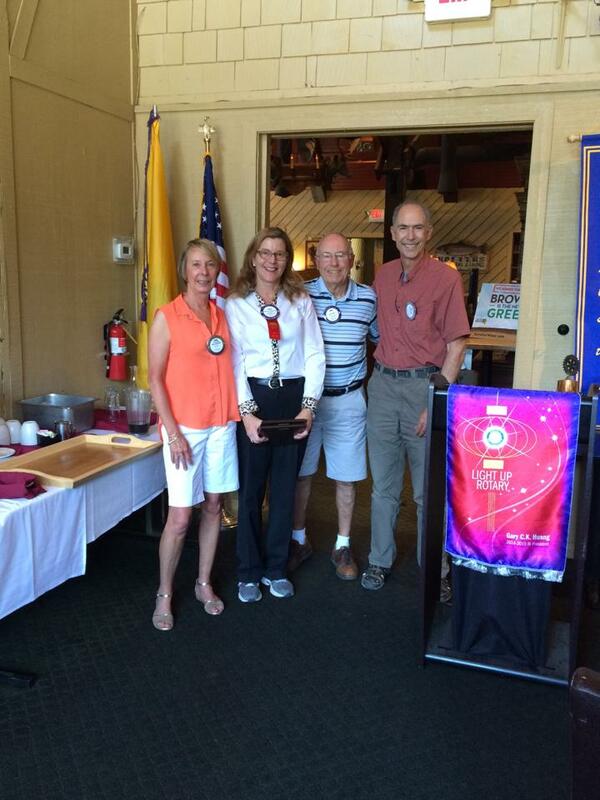 and Karen said "Thank you Rotary Club of Mammoth Lakes - it was wonderful to make new Rotary friendships! A great visit with you, looking forward to our paths crossing again." 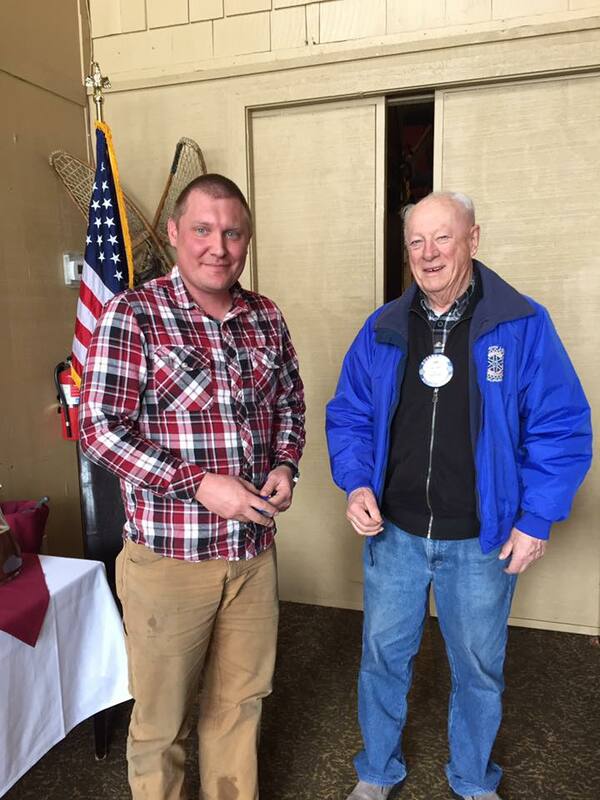 Bill Taylor receives the Service Above Self Award from Doug McDonald, during his District Govenor's visit to our Club. 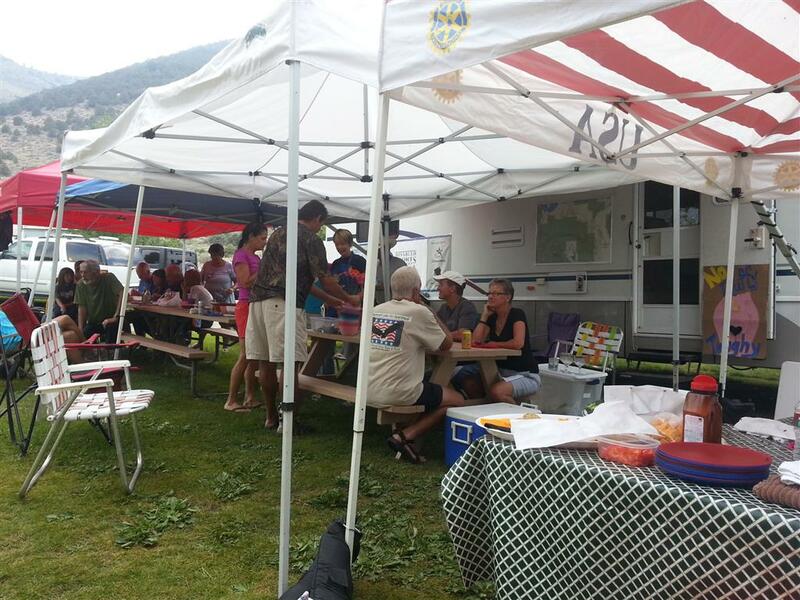 Rotarians manned the aid station at Hidden Valley Rd. for the Mammoth 1/2 Marathon on Fathers Day morning. 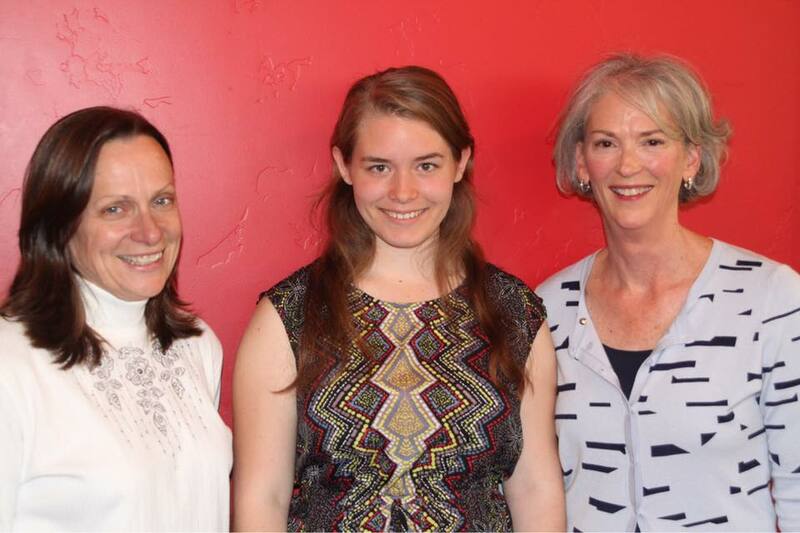 Allison Robinson of Bishop Rotary, Hope Reeves, junior MHS and Luan Mendel, President Elect, Mammoth Noon Rotary. Congratulations to Hope who won the speaking contest. She now advances to the District 5190 competition on May 20th in Reno. Congratulations Hope and Good Luck! — with Luan Beaty Mendel. 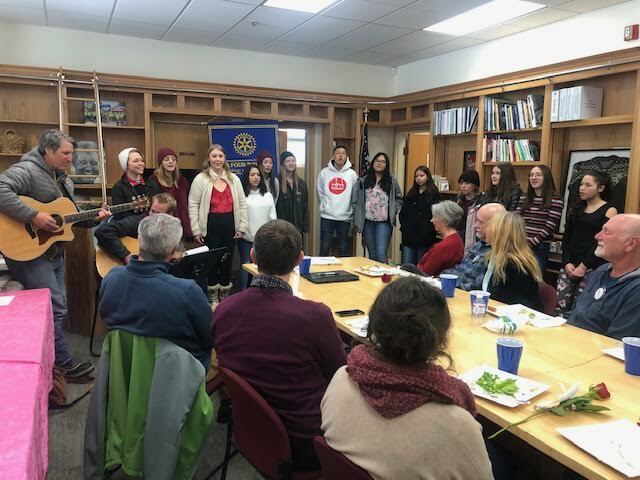 Each spring Rotary clubs around the world invite young musicians to participate in a series of competitions that begin in their local clubs and progress to a national event. These instrumental music contests were created to give young people opportunities to develop and showcase their exceptional musical talents. 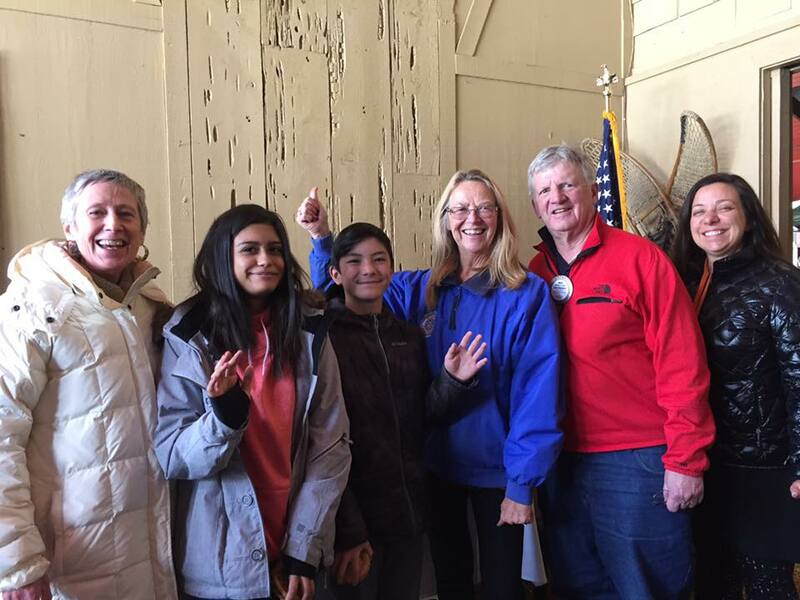 On March 29, the Rotary Club of Mammoth Lakes hosted its club-level competition, which featured four talented young musicians. Winner Ari Schuldt played Rachmaninoff’s Prelude in G Minor on the piano, while second place finisher Guy LaBorde played an original composition on the bass guitar. Melanie Moyer, who took third, played Gabriel-Marie’s La Cinquantaine on the violin, and Cardiff Smith played Haydn’s Surprise Symphony Variations on the trumpet. All four competitors received prizes, and Ari Schuldt advanced to the next level of competition. The audience and judges were inspired and entertained by the music these young people created. Congratulations to all! John Urdi, Executive Director of Mammoth Lakes Tourism, is today's speaker. Kevin Kian presents today's program about his new position as Executive Director of the Mammoth Lakes Foundation. 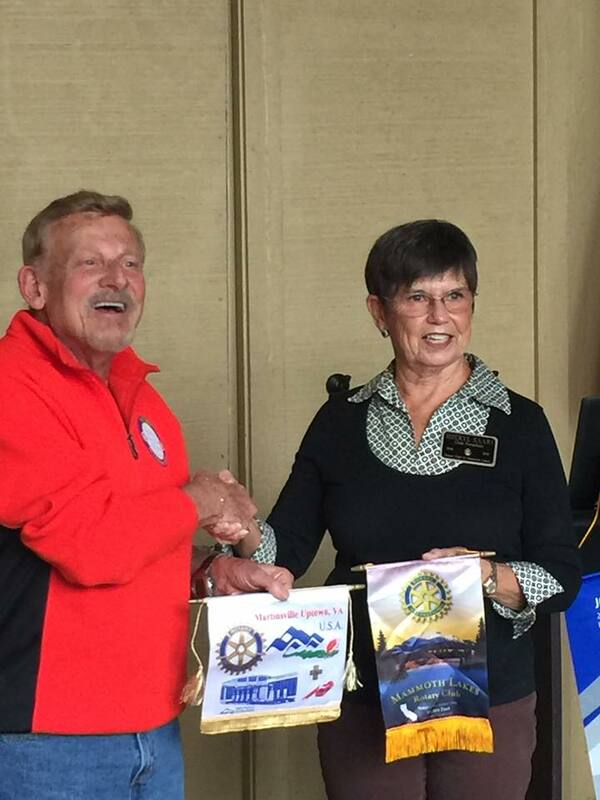 Sheryl Saari welcomes visiting Rotarian Dennis Reeves from Martinsville, VA and they exchange club flags. 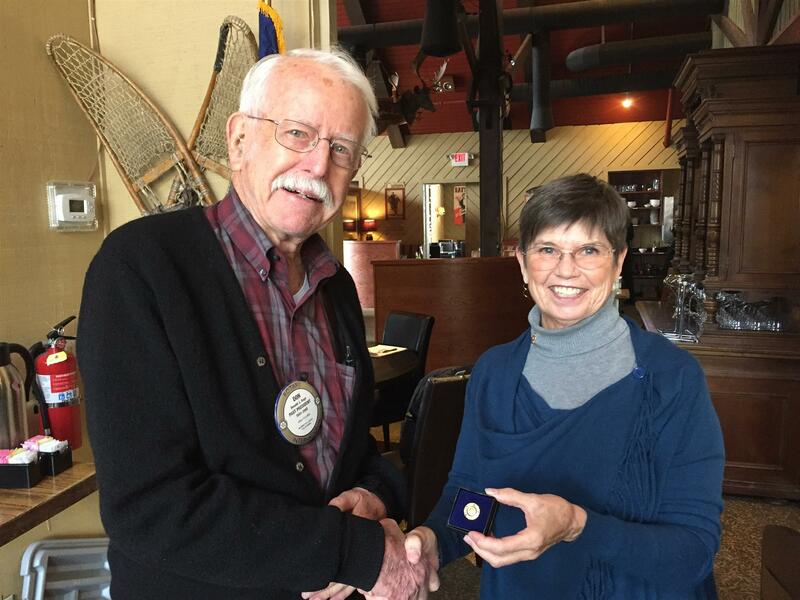 Robert Sharp, our newest member, Vice President of Eastern Sierra Community Bank, receives his Rotary pin and badge from Lois Klein. John Roberts, our newest member, recieves his pin and badge from Jim Clark. 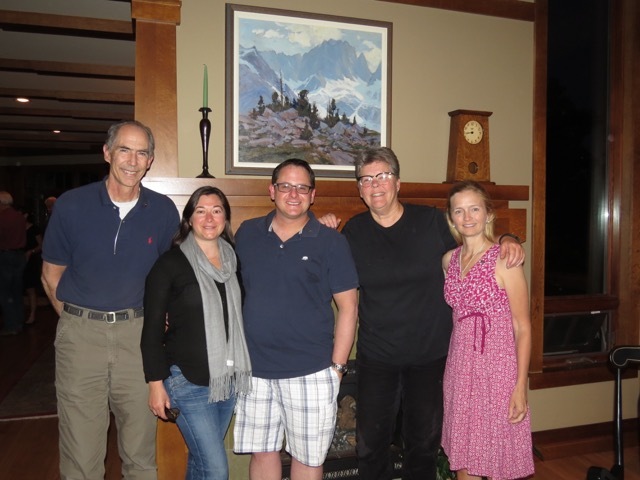 RYLA members Susy Fontana and Omar Falcon Aburto stop by for a visit, pictured with Rotarians Lois Klein, Joanne Hunt, Rick Phelps and ? If you're buying on-line using Amazon.com, help our Rotary organization raise funds by using smile.amazon.com instead of the regular Amazon web site.The difference is that when customers shop on AmazonSmile (smile.amazon.com), the AmazonSmile Foundation will donate 0.5% of the price of eligible purchases to the charitable organizations selected by customers and we would like you to select Mammoth Lakes Rotary Club Foundation. 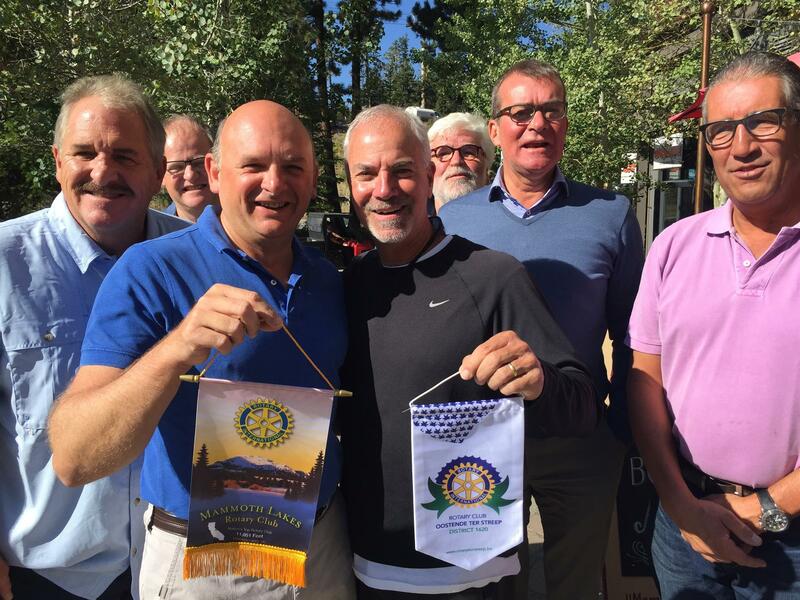 Mammoth Lakes Rotarians exchanging flags with our new friends from Belgium - fun stuff! 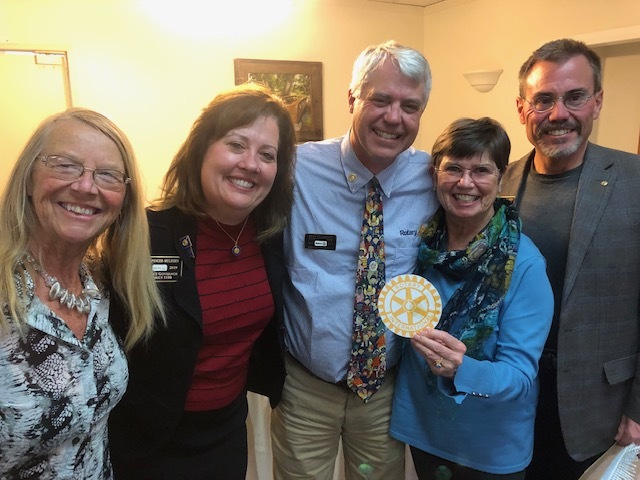 Our incoming President, Sheryl Saari, invited past Mammoth Lakes Noon Rotary Presidents to attend our luncheon and tell us about their experiences and accomplishments as Presidents. 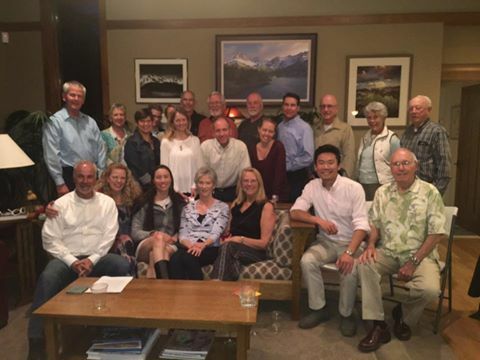 Starting in the front & center are Bob Tomko, our club's founder in 1981, and his wife Bea. Then from left to right are Neil McCarroll (2005-2006), Don Sage (2001-2002), Michael Bornfeld (1998-1999), Rodger Guffy (1992-1993), Chuck Tomajko (1997-1998), Bill Taylor (2014-2015), Nancy O'Kelly (1996-1997), Byng Hunt (2003-2004), Sandra Hageman (2015-2016), Linda Wright (2011-2012), Rick Liebersbach (1986-1987) and Rick Phelps (2012-2013). This is 35% of the club's Presidents spanning 35 yrs. of existence! 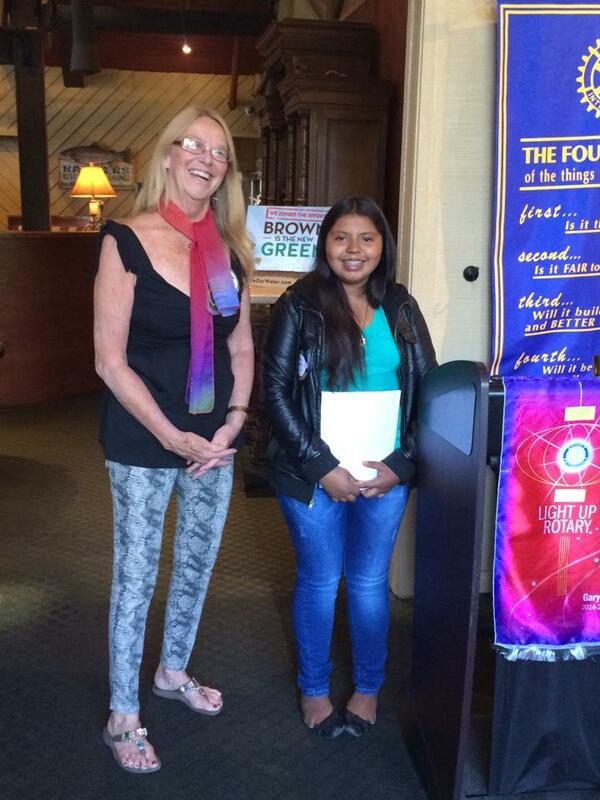 I am very excited to announce the two newest Rotary scholarship recipients. The first award was presented to a member of MLHS Interact Club. 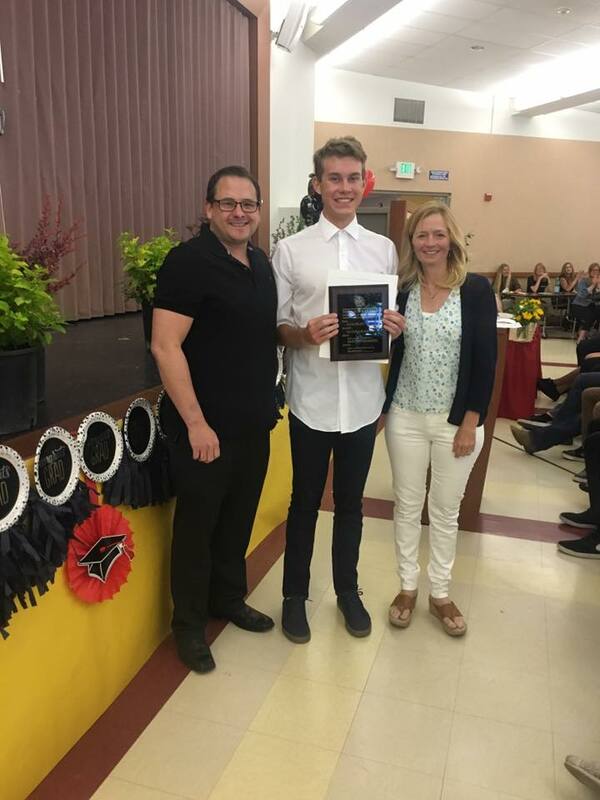 This award recognizes a graduating student who has been involved in the Rotary Interact Club while exhibiting high standards in leadership and community service, along with a strong academic performance. Alexis Brode is our Interact scholarship awardee. Alexis has been an active member of Interact by participating in school and community (local and international) service projects during high school. She has helped raise funds for people in need. 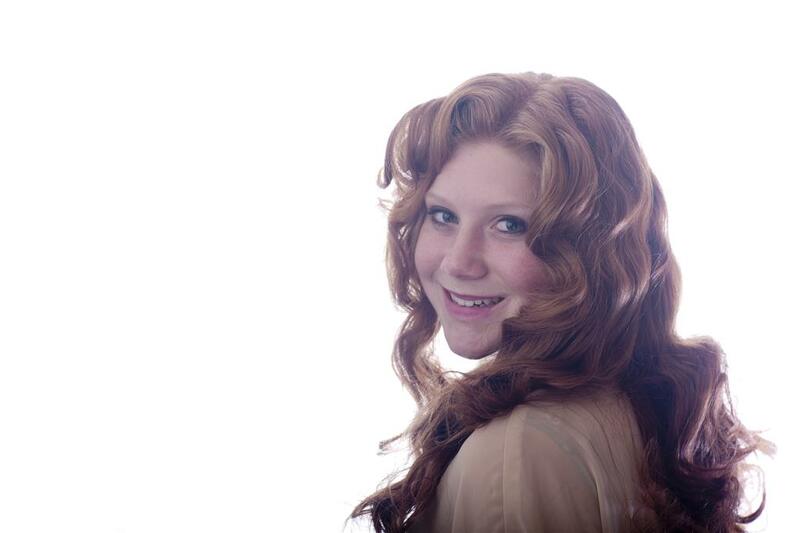 She exhibits strong leadership skills and is a pleasant young lady with great potential. 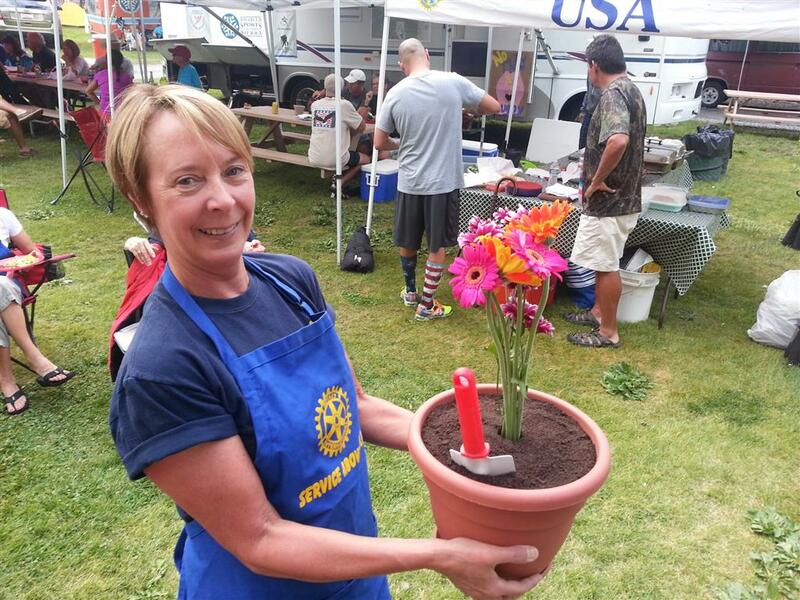 Alexis lives the true spirit of Rotary. 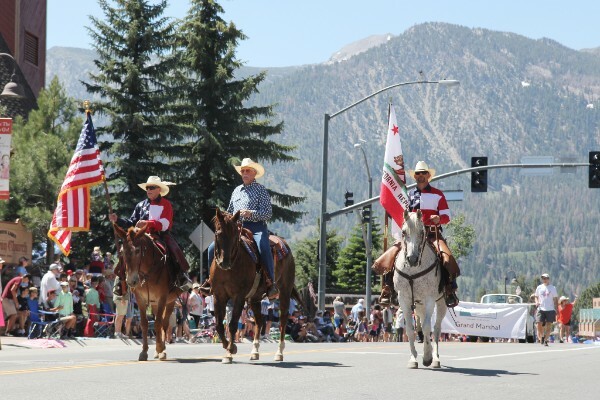 The second award was designed to compliment the Mammoth Lakes Foundation Scholarships for MLHS students continuing to Cerro Coso Community College. 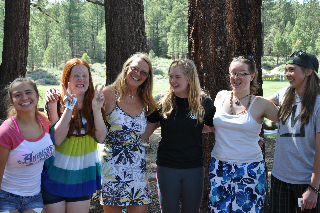 Our scholarship provides an award to a student attending Cerro Coso with plans to continue onto a four year college. The award will FULLY pay tuition for the final two years of the degree at any Cal State or UC campus, or UNR. Calvin Forsythe is our first recipient of this award. He has repeatedly given back to our community through volunteering to numerous sport and festival events, and at our local hospital. He has helped raise funds for various community service organizations. Calvin has an outstanding academic and athletic track record. He has been a role model to younger athletes. Calvin is a local kid with a local heart. We will likely see him back in our community after completing his degree. 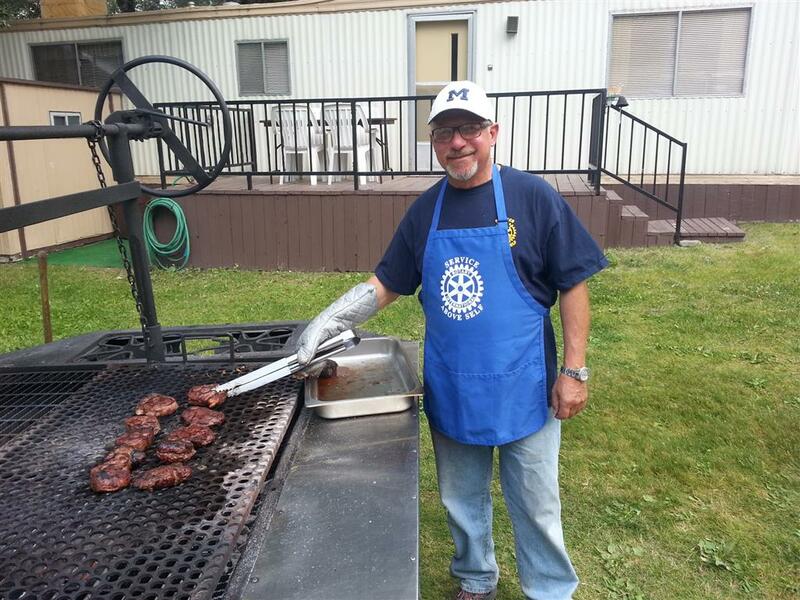 We can count of him to continue to give back in the true spirit of Rotary. Congratulations to both of our awardees. And, a big thank you to our committee members and membership for their role in making these awards happen. We should feel very proud of these accomplishments. The 2016 Pamper Pedal is an all-ladies ride hosted by the men of Eastside Velo. 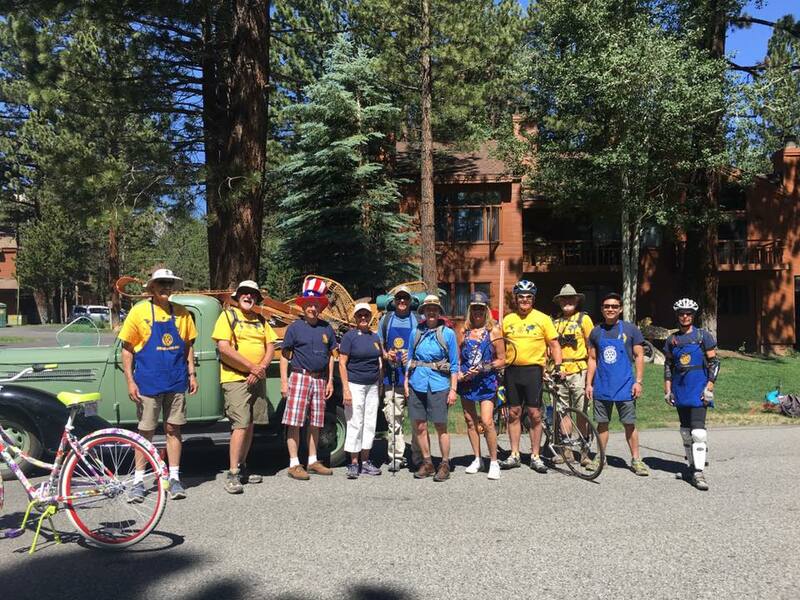 The ride started on May 7, 2016 at the Elks Park in Bishop and concluded 36 scenic miles later back at the Park. 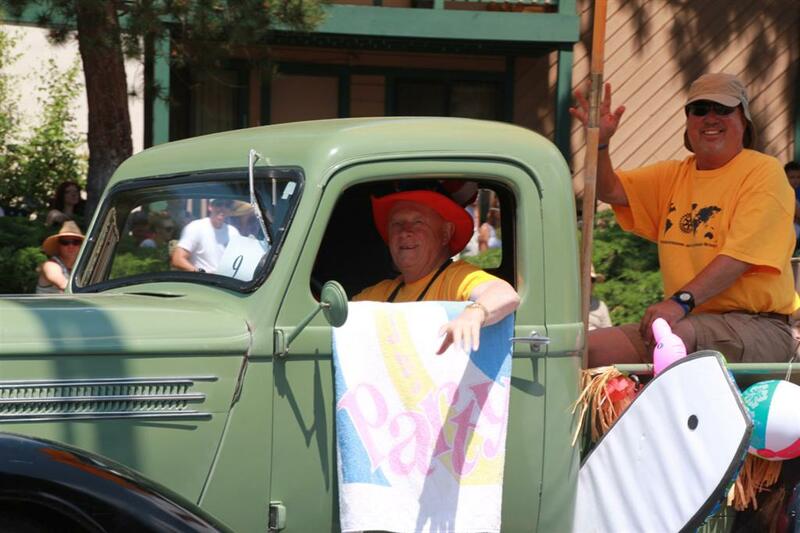 This was the 10th anniversary of this ride, and the Pamper Pedal is celebrating by honoring the first year's event with the theme "Back to the Bedroom." 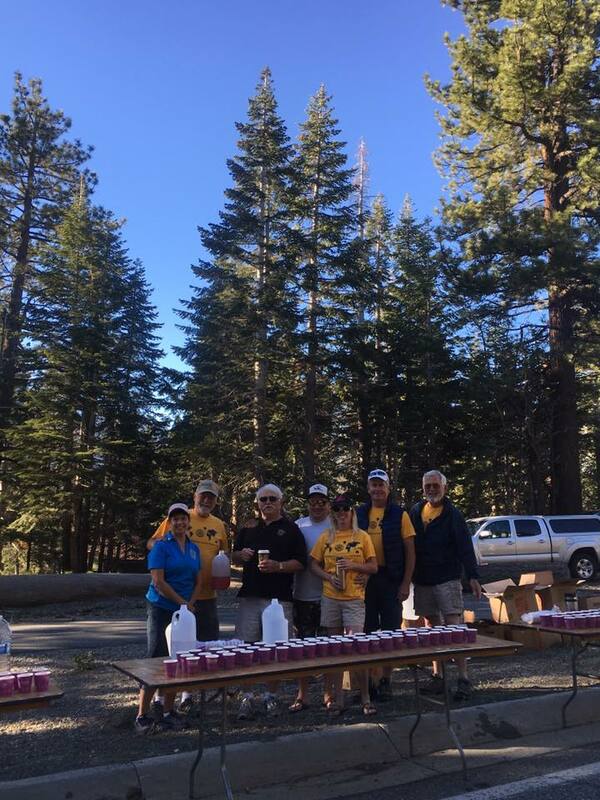 Mammoth Lakes Rotary Club supported the event by providing refreshments at the Round Valley checkpoint. Helping out are Craig Schmidt, Dennis Brown, Gary Sill, Jim Clark and Rich Boccia (the photographer). Thank you to those who helped with our "Rotary at Work" project last week. 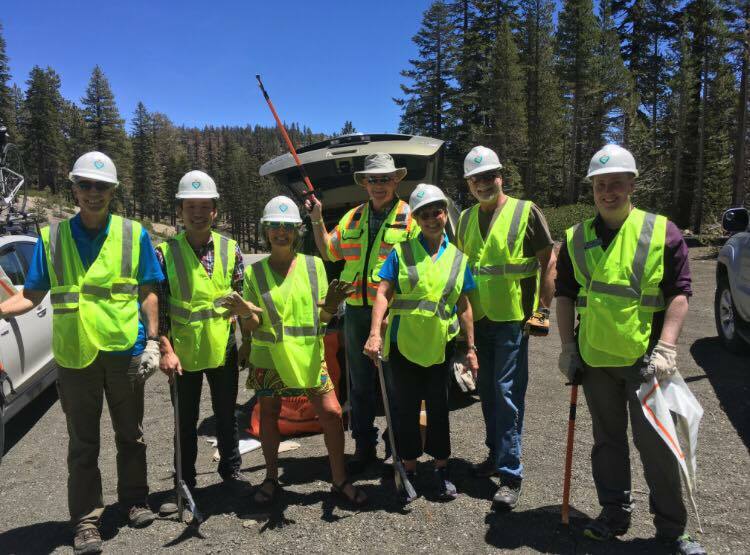 Our clean up team: Bill, Don, Dennis, Linda, Rich, Sandra and two of our newest members, Kevin and Sierra. 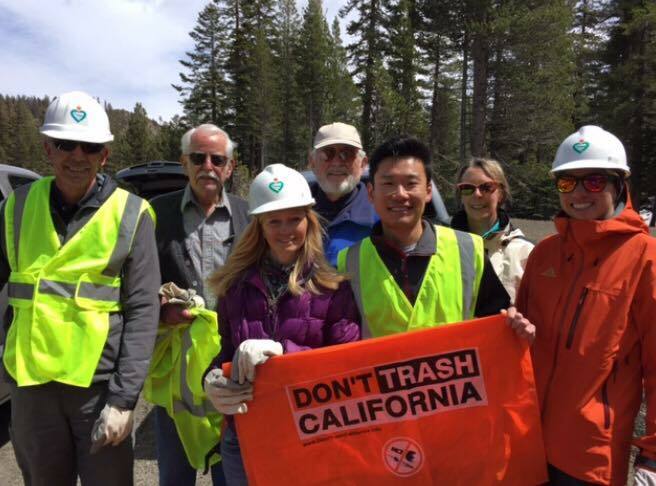 We collected quiet a few bags of trash along our part of the road that was no longer covered by snow. 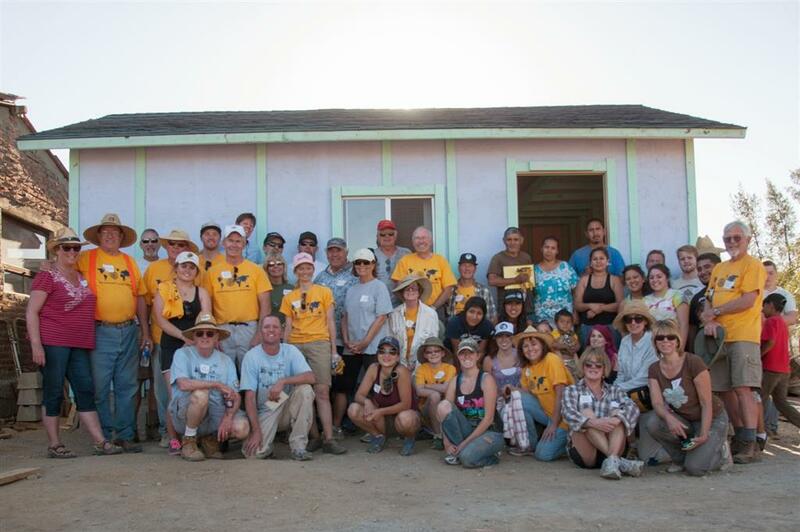 The April 9th house build in Tecate was great. Our lead builders, Tom and Nancy, along with Pete and Mike kept us on track. We built a house with a bathroom and were finished by 4 pm. The weather was cool and cloudy, perfect conditions, and it didn't start raining until after we crossed back over the border into California. Some of us enjoyed a Tecate Beer in the hotel parking lot afterwards, and almost everyone attended the festive dinner at Por Favor Mexican restaurant afterwards. There were no problems with the project and everyone but Tom Lake from South Pasadena had their passports crossing the border. I understand he groveled and humbly apologized for being dumb when confronted by the immigration officer at the border and they took pity on him and let him back into the country. Kathy Watson from South Pasadena took over 900 photos and will put together a program and send it to both clubs. 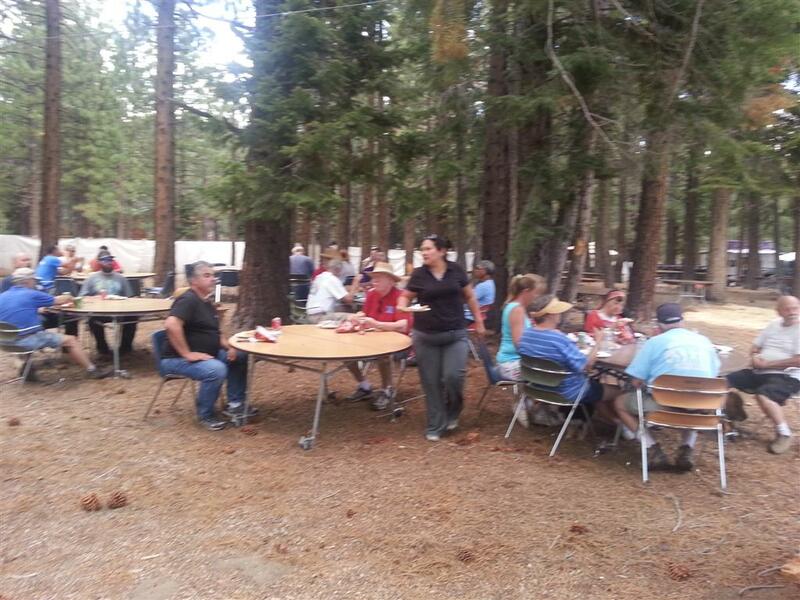 Thanks to everyone who participated in making this joint Mammoth Lakes-South Pasadena project a success. A special thanks to Johanna Bishop from Bishop for once again leading the Bishop Interact contingent. Finally, a huge thank you to Pat Hayes, ably assisted by Cynthia, for putting all of this together. 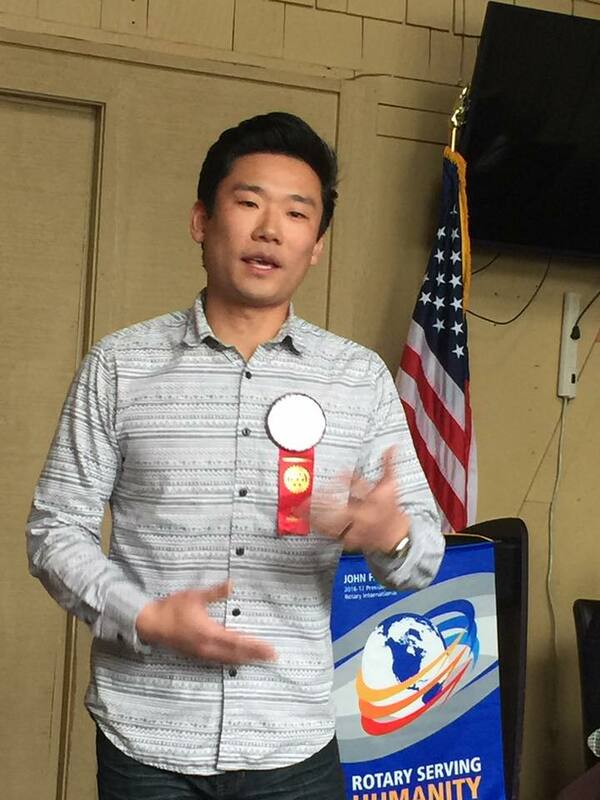 Rotary Speech Contests: The Area 13 Rotary Youth Speech Contest will be held at Astorga's Mexican Restaurant (2206 N Sierra Hwy) in Bishop on Wednesday, April 13 at 6 pm. 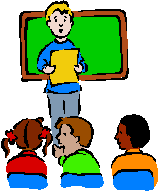 Parents and Rotarians are invited to attend contest, and we need a couple of volunteers to help judge the speech contest. Please let Luan Mendel if you are available to help with either event. Save the Date: District 5190 Conference Celebration, May 13-15, at the Atlantis Resort and Spa in Reno. 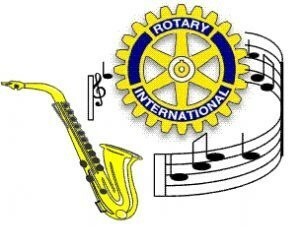 Registration is available on the District website: http://www.rotarydistrict5190.org/. If you are interested in volunteering for the conference, please connect John Novak at jnovakdmd@aol.com. 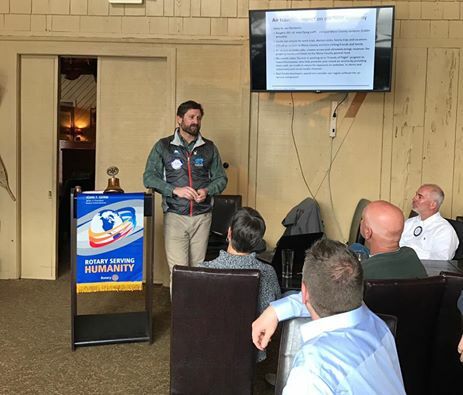 If you are interested in learning more about Rotary, please sign up for My Rotary on www.rotary.org, then click on My Rotary if you have not already created an account. It only takes about a minute to do. We are less than ten weeks away from heading to Tecate to build a house! It is time to register with Corazon. You cannot go if you haven't registered with them. If you have not previously participated in one of these projects, there is a two-step process. First, you must register with Corazon as a new volunteer. 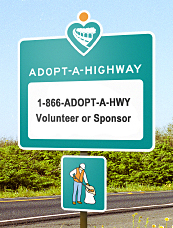 Once you do, you will get an email back from them saying that you are a registered volunteer. Then you must register for our project on April 9. Click on "Volunteer Now", then "New Volunteer Profile"
Proceed to fill in the profile and complete all sections; when completed, select "submit"
Once you have registered, then go back to Corazon.org, select "Volunteer Now". Click on "volunteer log in" instead of "new volunteer profile"
Fill in April 2016 in the space, or advance forward each month until you get to April. There are several projects scheduled for April, 2016. 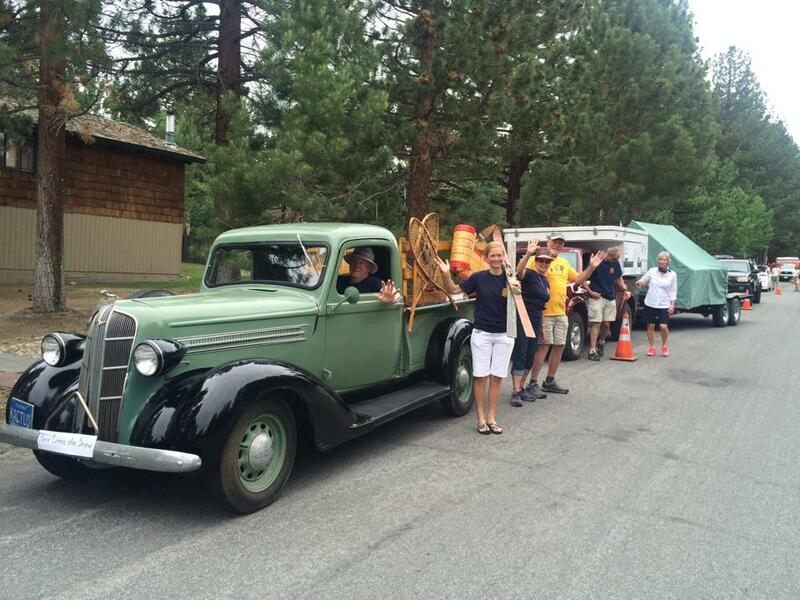 Register for the one that is being sponsored by Mammoth Lakes Rotary, project number 00011581. 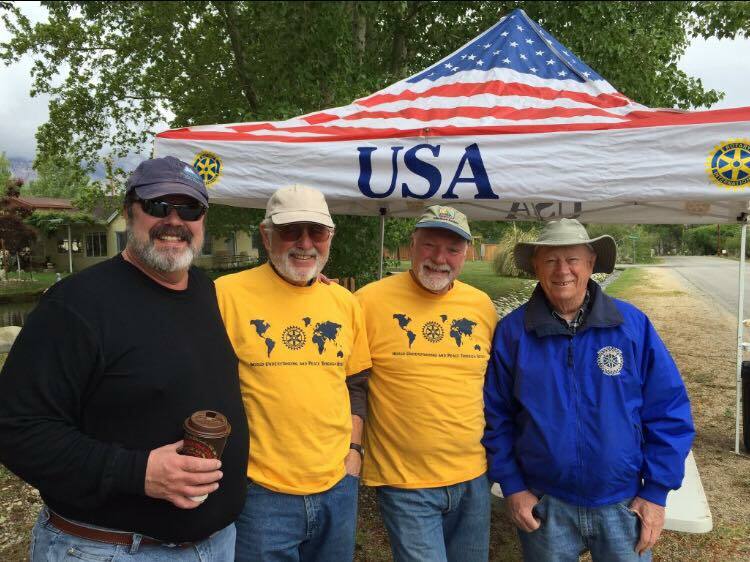 There are currently 14 Mammoth Lakes Rotarians/family and 25 South Pasadena Rotarians that have expressed interest to me in participating. So far only 15 people from both South Pasadena and Mammoth have registered. Currently, no Interact kids have registered from either Mammoth or Bishop. 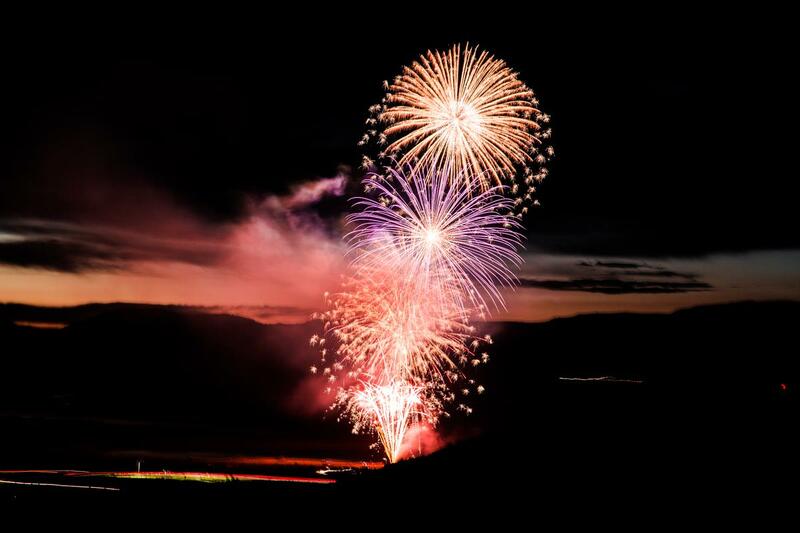 Joanne and Anneke – please update me on who will be participating, thanks. PLEASE SEND ME AN EMAIL ONCE YOU'VE SIGNED UP FOR OUR PROJECT. I keep track of that and it lets me know a confirmed number. Also, we need volunteers to drive to Tecate from the USA. Several have volunteered, I need a couple more to volunteer. I have reserved a room at the Best Western Plus La Mesa, (619) 466-0200 or online at bestwestern.com. They have a limited number of rooms, first come first served. This location is pretty good, however you may stay anywhere you wish. We will have a team dinner after the build on Saturday night at Por Favor in El Cajon. I will be sending more information, list of what to bring, etc. AND DON'T FORGET TO BRING YOUR PASSPORT OR PASSPORT ID (Note to self!) US Customs no longer allows entry without a valid passport. Any questions, or if you have someone you'd like to add, or need to back out, please get hold of me. 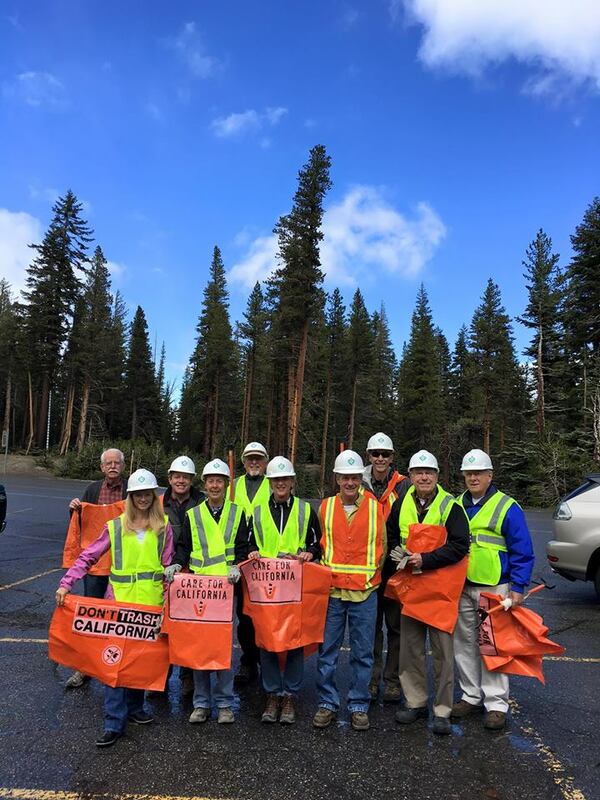 A fine looking crew braved the elements for the Highway 203 clean-up today. And yes, it is snowing on Mammoth Mountain. (l-r) Don Sage, Sandra Hageman, Marshall Rudolph, Linda Wright, Dennis Brown, Luan Mendel, Joe Hageman, Bill Taylor, Tony Taylor, and Jim Clark. Join Wild Iris for the screening of the short film titled "ReMoved". The screening will take place at the first annual Hope Outloud event, October 9th at Eagle Lodge from 6:30-9:00 pm, and on October 23, 2015, at Inyo Council for the Arts in Bishop, from 6:30-9:00 pm. The screening of this powerful short film highlighting the devastating effects of domestic violence on children, and the need for foster families and CASA’s in our community. Tickets are $15 and include the screening, a glass of beer or wine, appetizers and a Dutch auction raffle ticket. Tickets may be purchased online @ www-wild-iris.org, or by calling 760-873-6601. Geoff McQuilkin, Executive Director of the Mono Lake Committee presented at our noon meeting. The Mono Lake Committee is a nonprofit citizens' group dedicated to protecting and restoring the Mono Basin ecosystem, educating the public about Mono Lake and the impacts on the environment of excessive water use, and promoting cooperative solutions that protect Mono Lake and meet real water needs without transferring environmental problems to other areas. 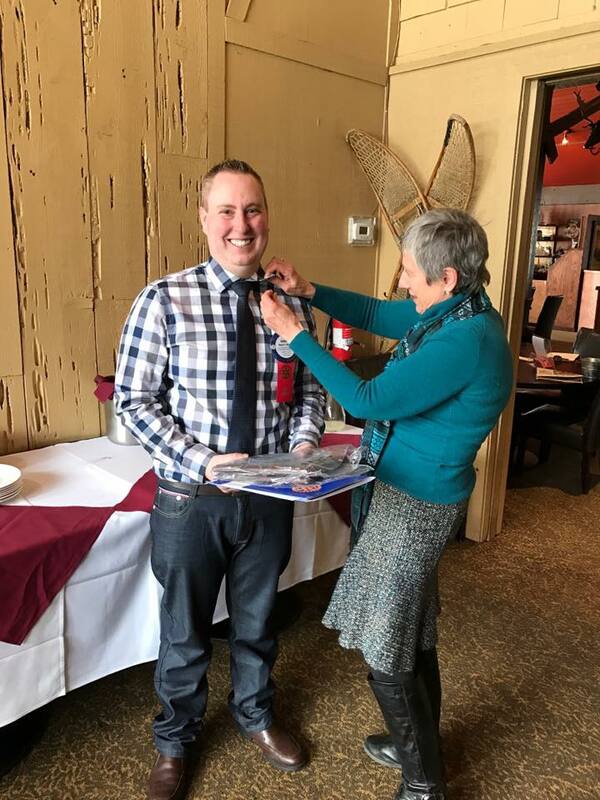 Welcome our new member, Sean Easterny (with the red ribbon on her badge). Presenting her the new membership materials are her sponsor Linda Wright, Membership Chairman Tony Taylor, and President Bill Taylor. 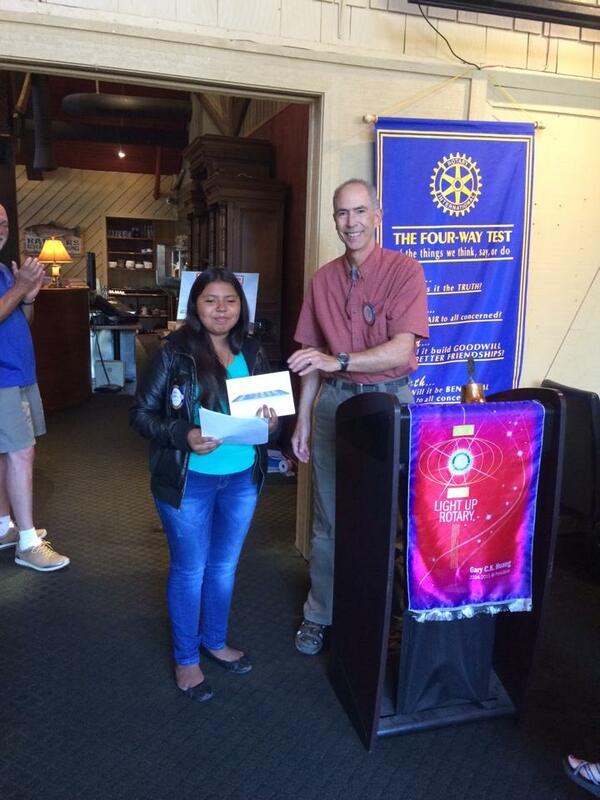 Lupita Garcia receives her new Mini IPad from President Bill Taylor after winning the 4 Way Essay contest. Also show congratulating Lupita is Joanne Hunt. 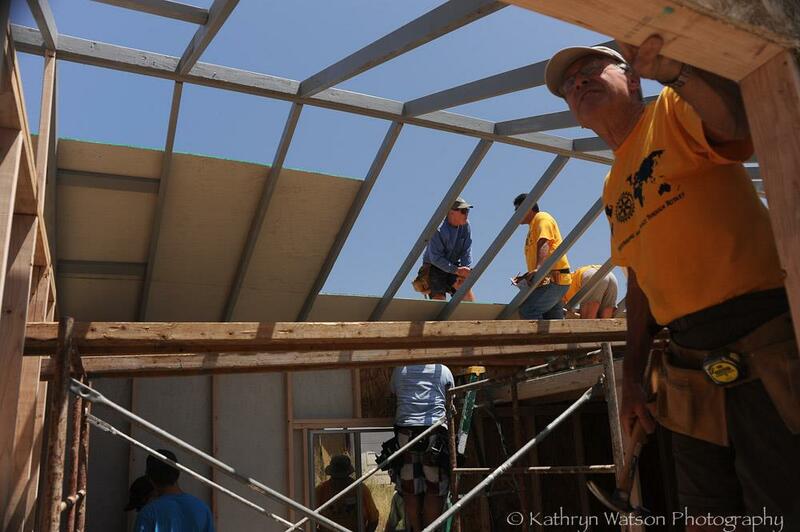 On Saturday, April 25, the Mammoth Lakes Noon Rotary Club and 45 volunteers traveled to Tijuana, Mexico, to build a home for the Gonzalez family. Emily Hartman, Interact treasurer, together with Joanne Hunt, shared money raised selling root beer floats at the high school for Polio Plus. Don Sage passed the hat to increase the funds to $210. Good job everyone for such a great cause. 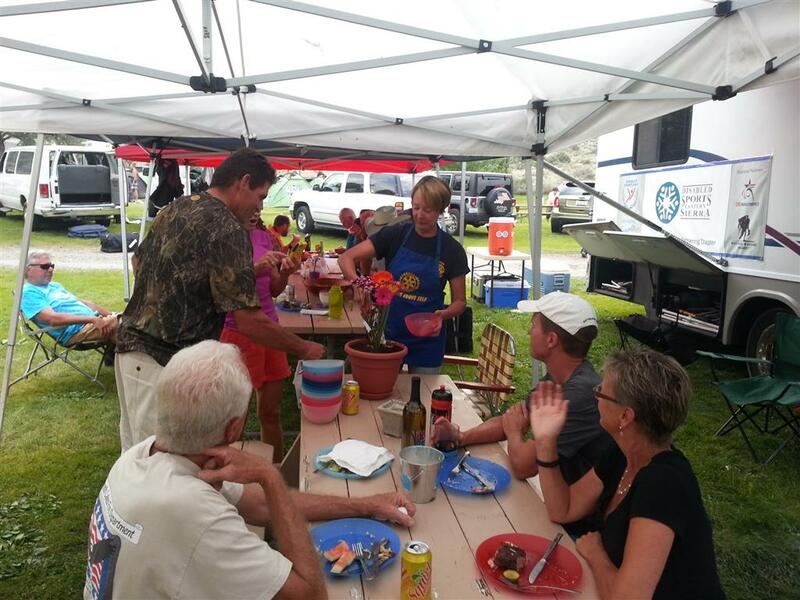 Rotarians Ed Forstenzer, at the grill, and Linda Wright, with her "Dirt Pie" in a flower pot, serving dinner to participants of the Disabled Sports Eastern Sierra's annual Sierra Cycle Challenge event. The Dirt Pie is actually a desert, made with Oreo cookies and pudding. It was yummy! 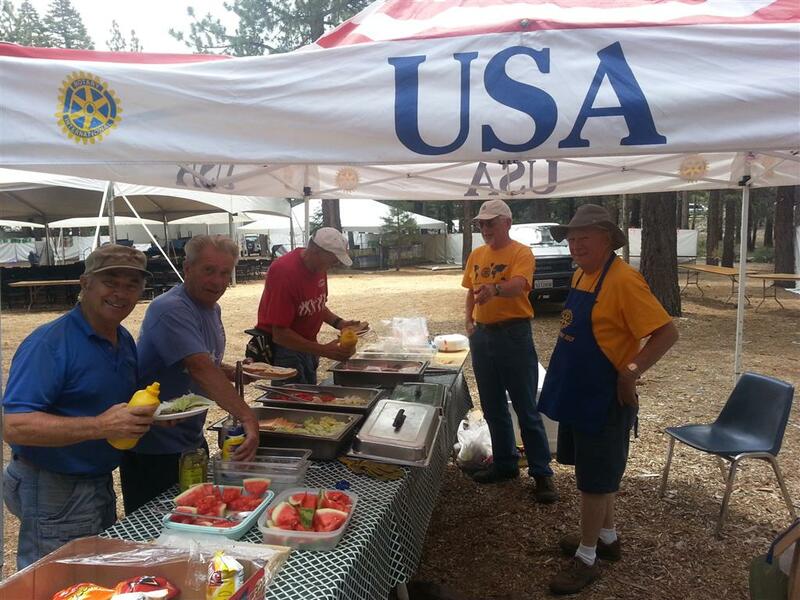 Mammoth Lakes Rotarians served lunches to volunteers who set up the 26th year of the Mammoth Jazz event this week. These volunteers, mostly people who live here, help every year in getting the various venues prepared for the many attendee to this major summer music event. 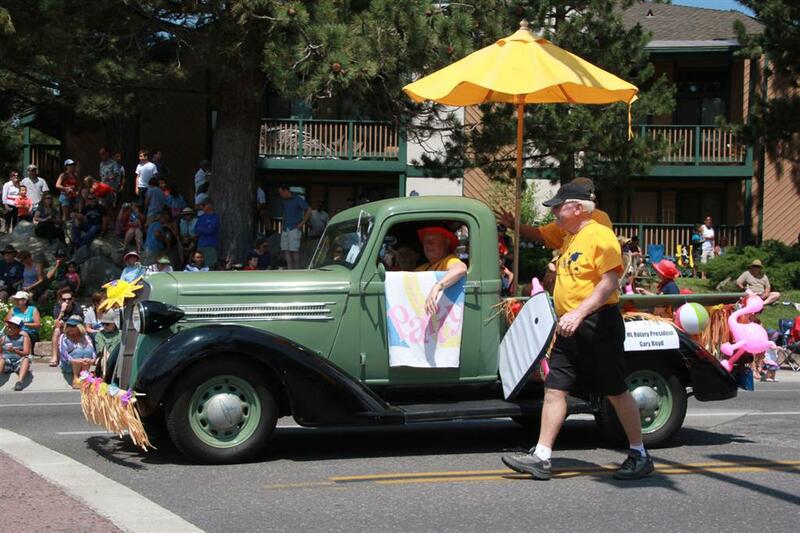 This year, Rotarians from both the Noon and Sunrise parade marched in the Mammoth Lakes 4th of July Parade with Jim Clark's 1936 Dodge pickup truck decked out in the Summer Fun decorations. 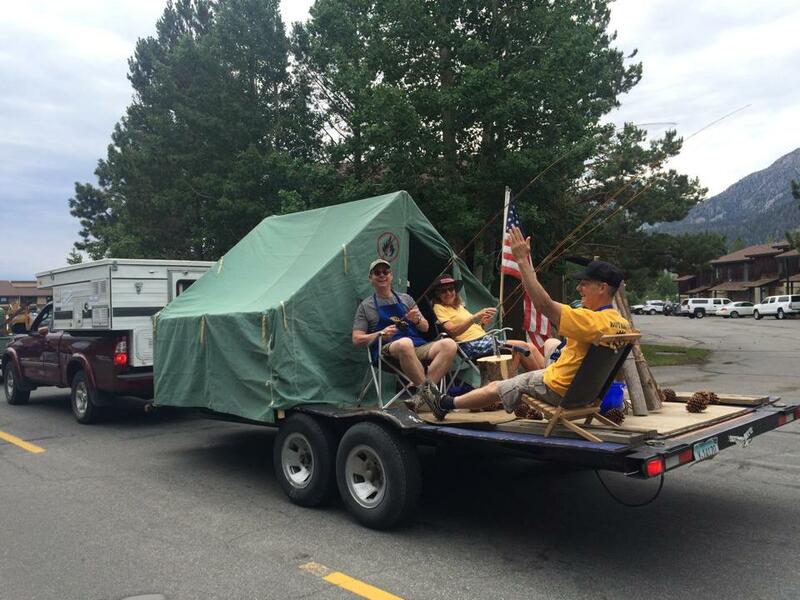 Announcers along the parade route helped advertise our Rotary motto, "Service Above Self" and the work we do in the community of Mammoth Lakes. 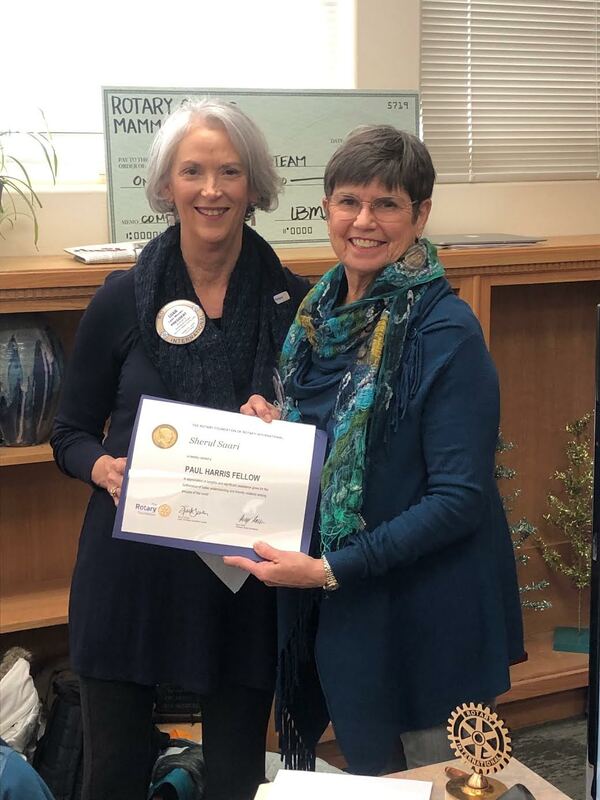 The Interact Club at Mammoth Union High School just received a Presidential Citation for Vicky Puliz, Govenor of Rotary District 5190. The Interact Club decided to bring a top inspirational speaker to MHS for their school project this year. Tyler was one of the speakers at a leadership camp, RYLA, that they attended last summer. Tyler spoke to the high school, middle school, and community school. He also spoke to the parents at night with help from the Booster Club. Everyone got a lot from his presentations. 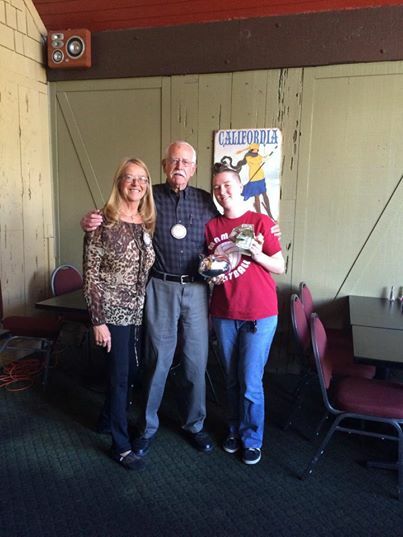 Mammoth Lakes Noon Rotary recognized Sabrina Clevenger as Academic Student of the Month for October for Science. Her teacher, Cheryl Hart said she is an outstanding student that has gone above and beyond basic requirements to take the most challenging classes offered at MHS. In her 4 years at MHS she has bee one of the top students in all of her honors and AP classes. One of Sabrina's characteristics that stand out most is her drive to understand a problem or concept rather than just getting the right answer. On a personal level, Sabrina is enthusiastic, curious, mature, giving, and helpful to staff and students. She is highly regarded by her peers and our teaching staff. In 2010 the MAMMOTH HIGH SCHOOL Interact decided to create a picnic area on the island in front of the school. 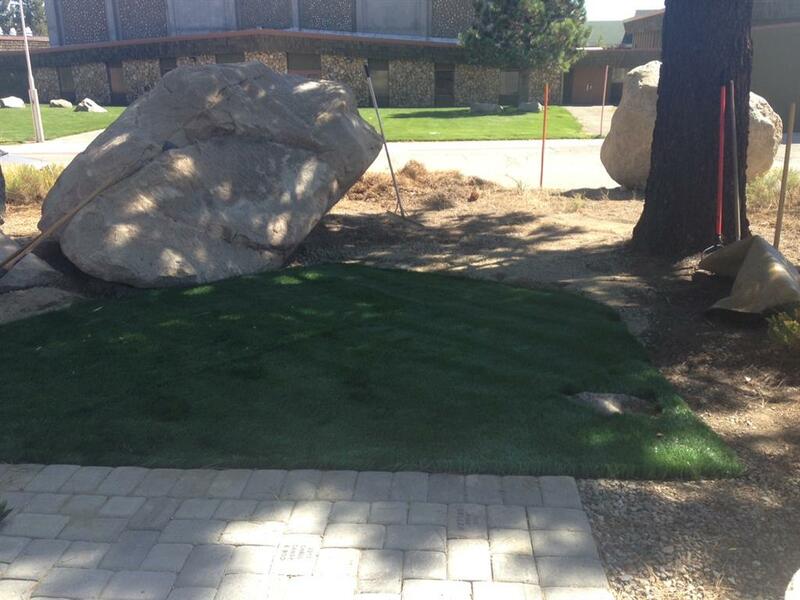 Since the students would sit on the large rocks, they thought it would be a great place for a patio. The first project was putting in area of pavers. Joanne & Byng Hunt presented the school with a beautiful bench built by Brian Jones. The next year they added to the project with steps and a walk way. Last year they purchased a picnic table. This year started off with artificial grass placed next to the patio. 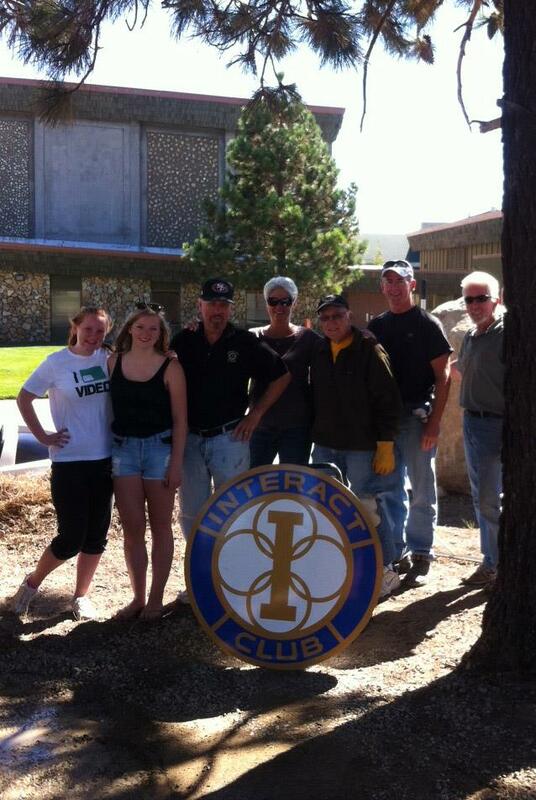 Interact students and Rotarians worked together to make this such a special project. 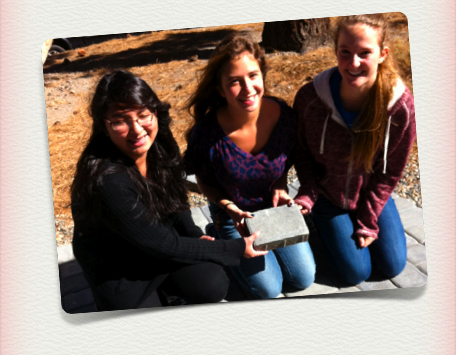 Each year the Interact Club wants to continue to improve the patio project. Our luncheon program today was about Mono County Department of Education's Choose Civility Initiative, given by Dan Watson and Bill Michael. For more information about this program, go to www.monocoe.org and, on the top bar, click on Choose Civility Initiative. This will take you to 3 other pages of information. There is also a story on the home page by Dr. Stacey Adler, Ph.D, Superintendent of Schools, who's pictured below, about this program. 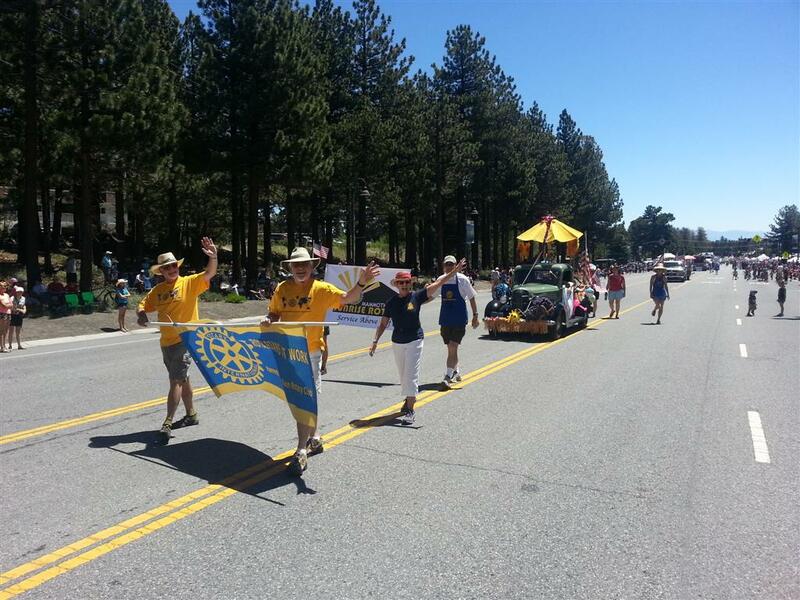 Here's our Mammoth Lakes Rotary Club entry in the 4th of July Parade. 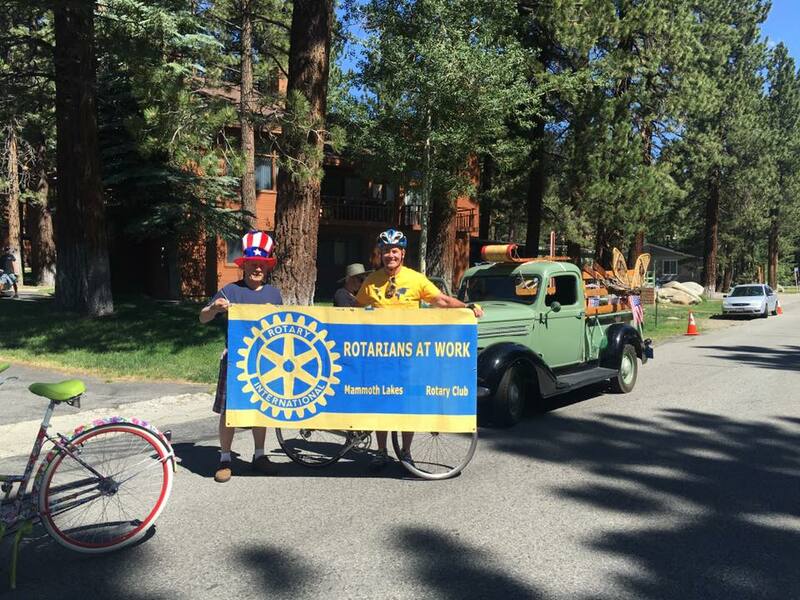 Carrying the "Rotarians at Work" banner are Bill Taylor (left) and Tony Taylor - (not related) on the right. 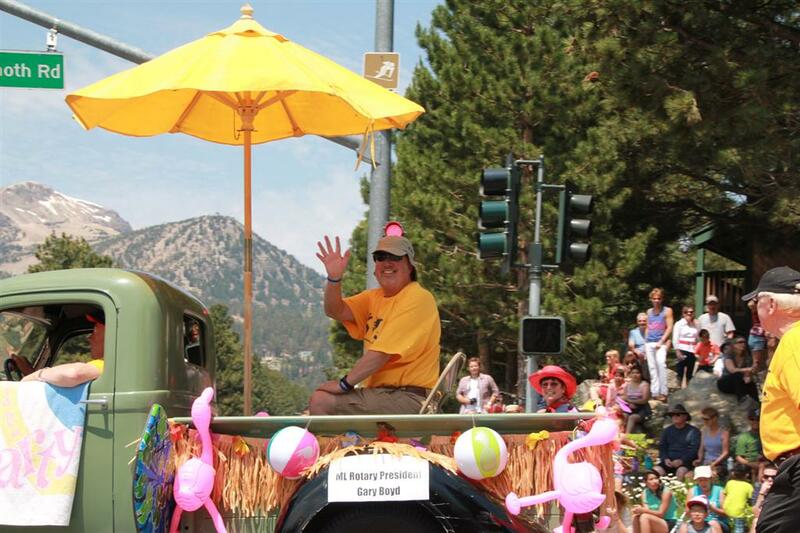 Driving his 1936 Dodge pickup truck is Jim Clark, and riding in the truck bed is Gary Boyd, our new President for 2013-2014. Passing out candy to the kids are Sheryl Saari, in the red hat, and Fred Anderson. 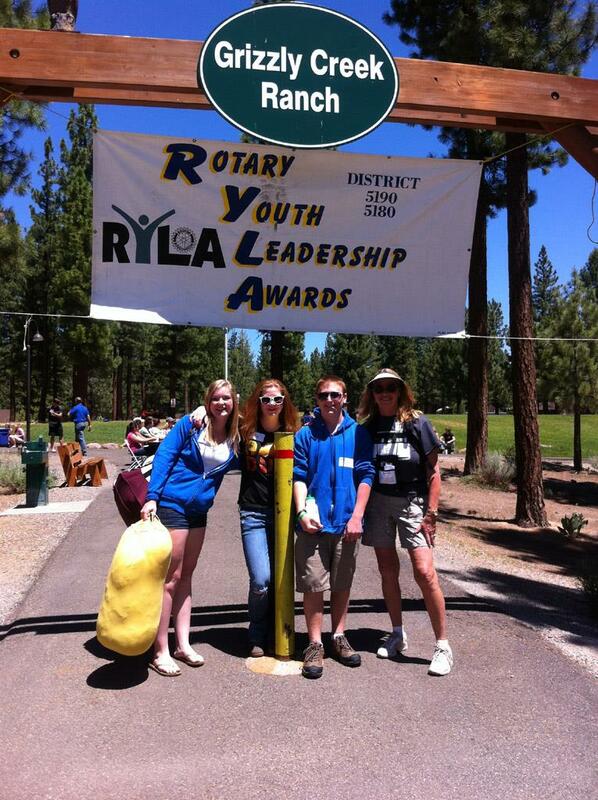 The RYLA (Rotary Youth Leadership Awards) camp was held this year in Portola, Ca. at the Grizzly Bear Camp. 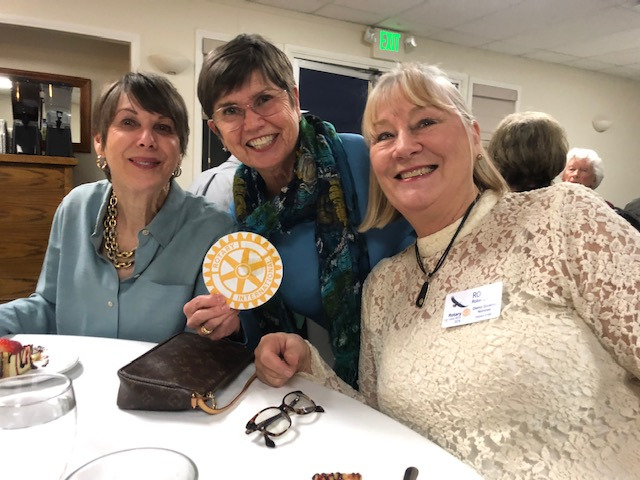 Since the two Mammoth Lakes Rotary Clubs have joined Rotary District 5190, we were able to attend the 5 day conference. 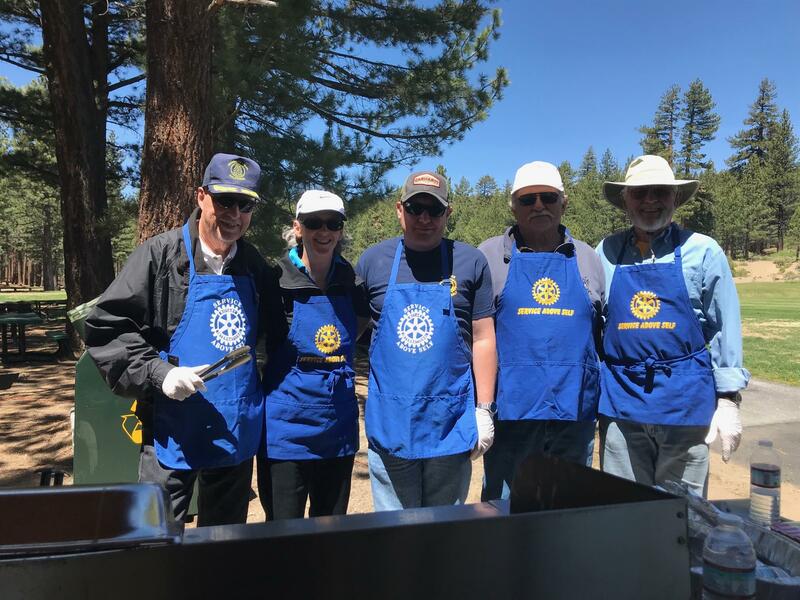 Between the Noon Rotary (2 students), Sunrise Rotary (1 student) and the Interact Club (1 student) we were able to sponsor 4 juniors from Mammoth High School. 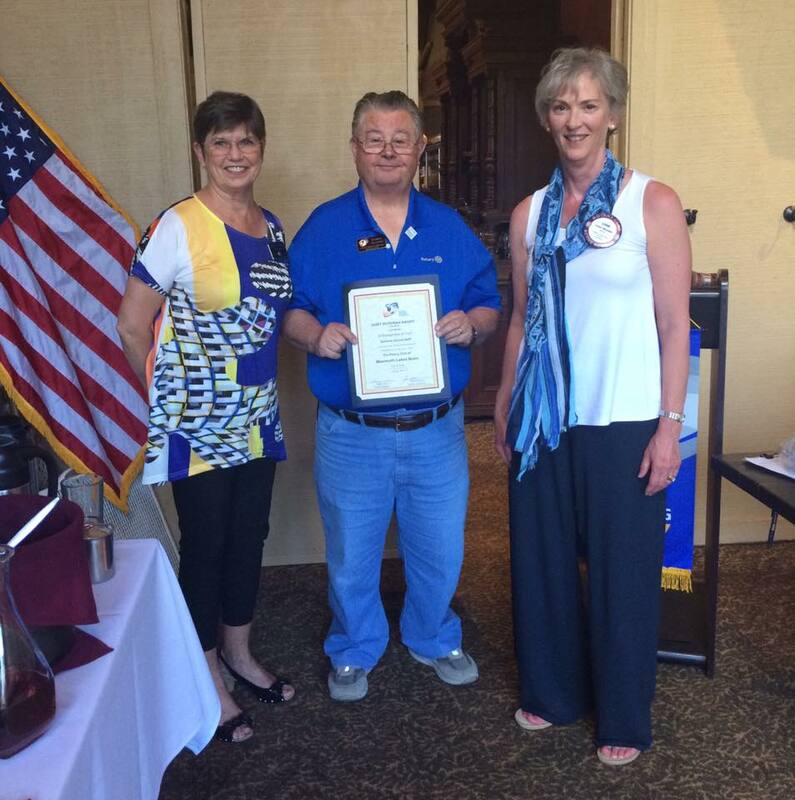 Joanne Hunt also attended as a counselor representing our club. Guest speakers were brought in each day to work on self enlightenment and develop leadership skills. We also participated in the Ropes course which included group activities to develop trust and teamwork on low level activities. 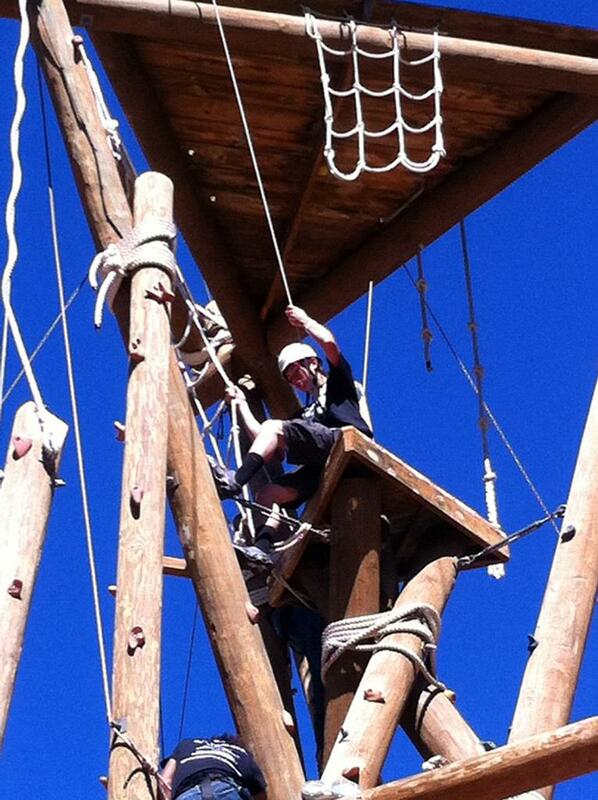 Then we advanced to the high wire, Alpine Tower and Zip line on the forth day. Even Joanne participated in the advance activities. Evening fun included Mental Olympics, a Candle light ceremony and Square Dancing. It was exciting to see the students learn how to square dance. The final night was regular dancing and signing autographs. "Celebrating the Family of Rotary"
with our Group Study Exchange group from India!!! 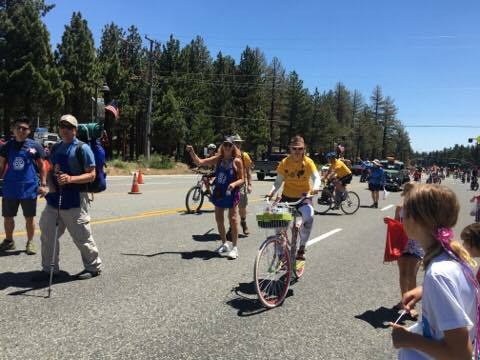 Today we see them off...on their way to Bishop next, then back up to Reno Nevada..and home!!! This YouTube video was created by Kathy Watson and has been published here with her permission. 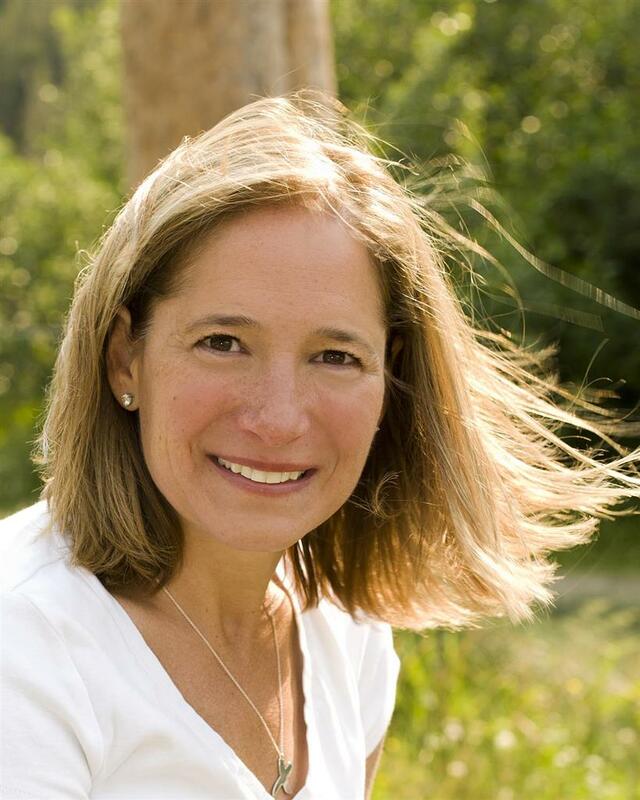 Our speaker this week is Stacey Corless. 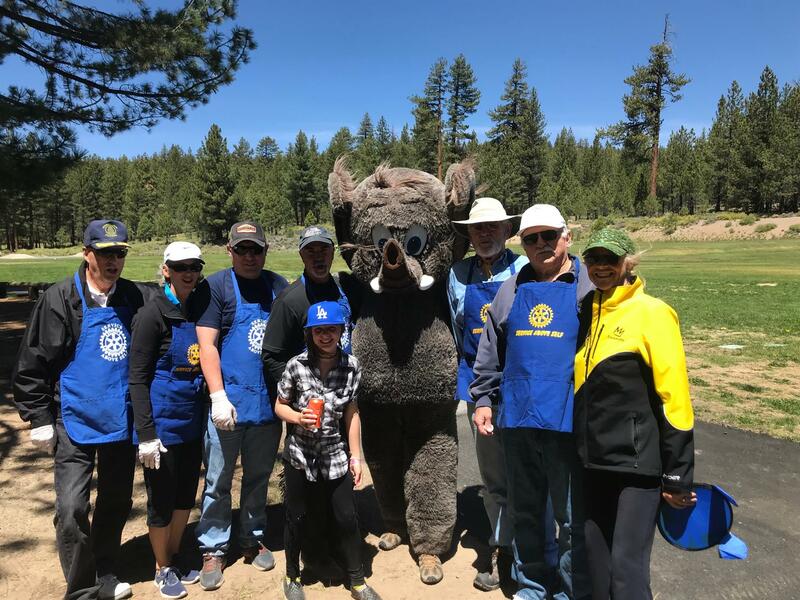 Stacey, a former Rotarian, runs the Mammoth Mountain Community Foundation and will bring us up to date on its mission and activities. 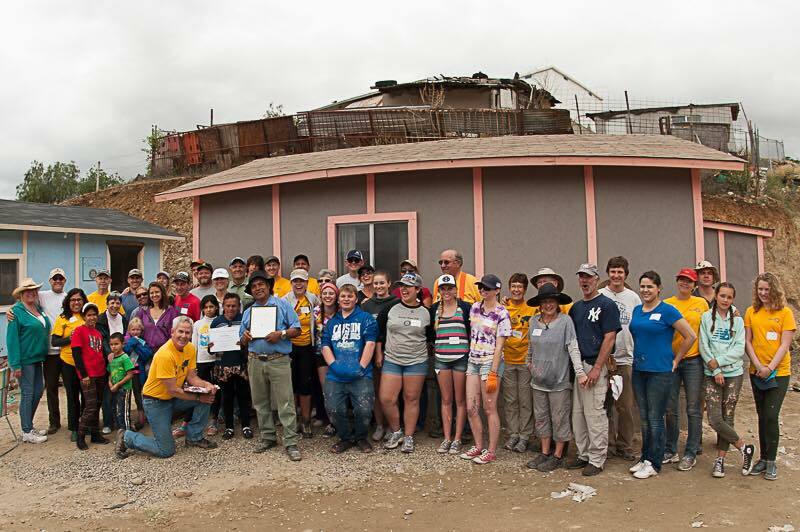 Working with Corazon, Inc. for a 2nd year in a row, Mammoth Lakes Rotary Club (Noon) is planning to build a house in a day in Tecate, Baja California, Mexico on May 18, 2013, for a deserving family. We need volunteers. Please contact Dan Watson, Project Coordinator at danielbwatson@aol.com if you're interested. Read on for more details. Our RYE Student & his host family is our program this week. Please come and share in this incredible international experience.